Daffodils blooming here on December 20…. Our morning was filled with bright sunshine and blue skies. It has been unusually warm here today. The clouds moved in this afternoon, but the nearly full moon rose early, and is shining brightly in a huge corona through the misty, drifting haze. It was still in the mid-50s at 7 PM here; a little above the usual mid-day high for us in December. But the garden is loving it! Yesterday morning, my partner told me about an odd flower he had spotted. He had picked it up where the rain had beaten it down into the lawn. He said it looked a little like a Daffodil. But isn’t it much too early for Daffodils in December? And he was right; on both counts. 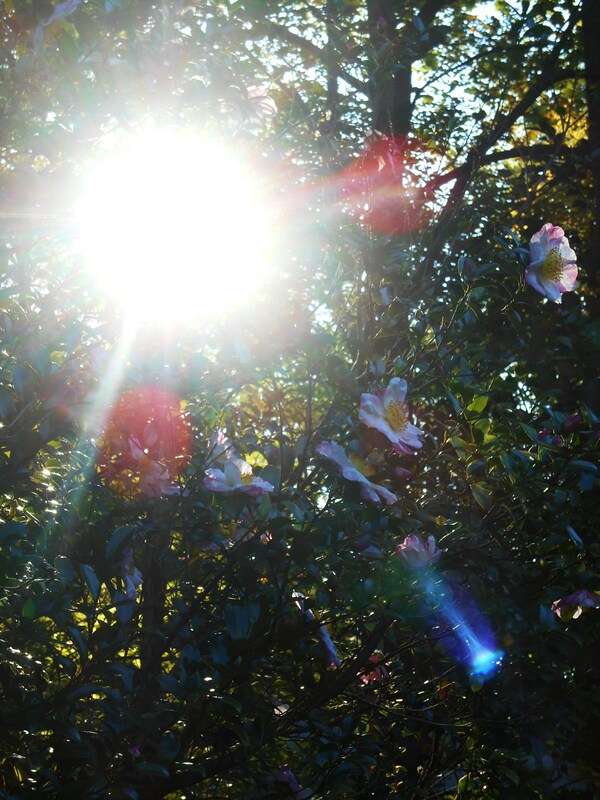 When I finally went out to look in the afternoon, the setting sun illuminated those yellow blossoms so sweetly. We had gone out to chase a few rogue deer who somehow snuck into the garden. And rounding the corner, there were golden roses proudly blooming on a climber which normally blooms only in the spring. It had re-awakened to share a few special winter blossoms with us. Even after a cold snap this weekend and frost on Saturday morning, the flowers keep coming all over the garden. We have Camellias and Violas, Snaps and roses. And now this golden Daffodil, too…. 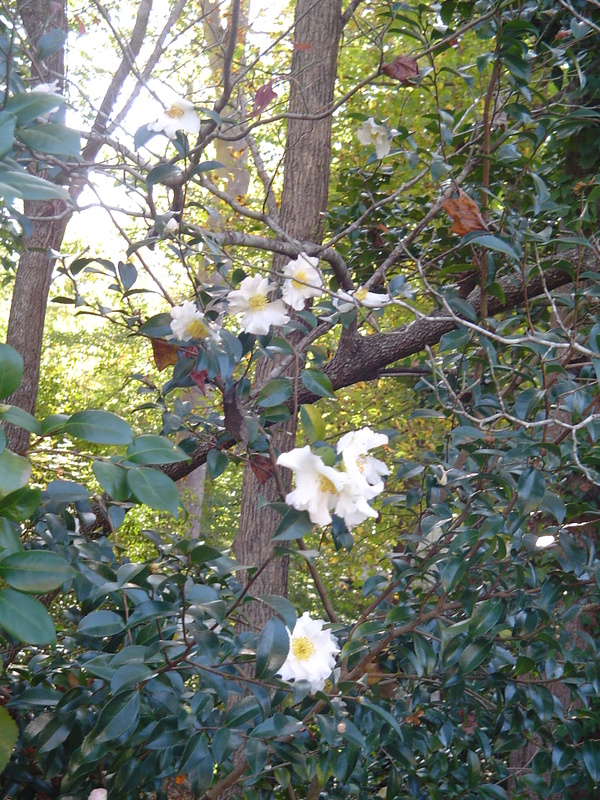 This Camellia normally blooms each spring. 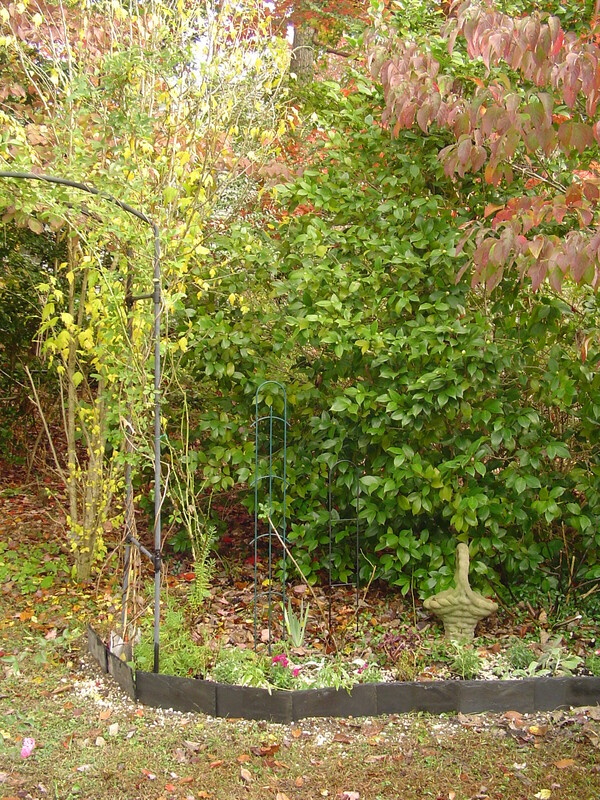 Do you see the open Forsythia blossom in the photo? 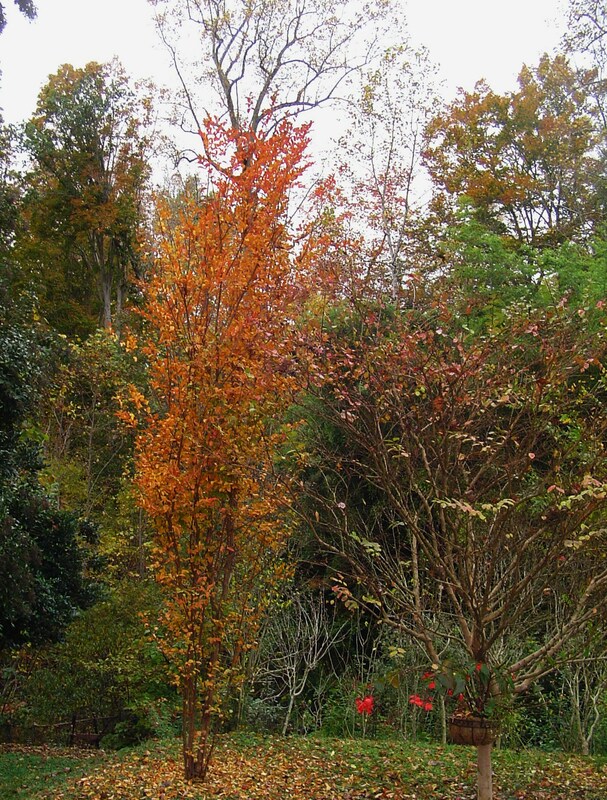 If it is 80 here on Christmas Eve, as is forecast, I expect this shrub to begin leafing out by New Year’s Day…. Indoors, our Amaryllis has bloomed in record time. And such blossoms! This is the special, huge, bulb I brought home form The Great Big Greenhouse in Richmond. What flowers! Only the first stem has bloomed so far, so we have at least four more blossoms to open this week. It was fine, until I moved it for better photographs. That upset the balance, and the stem and leaves were flopping over by early evening. Hindsight, right…? But now I’ve staked it with a coil of copper wire and a green stake from a peony cage. The flowers are standing up proudly again, so pretty in the morning sun. These final ‘blossoms’ are not flowers at all; they are our ornamental cabbages, with their outrageously ornate leaves. They appear quite happy with our mild December weather. They will hold up to snow, but too many bitterly cold nights will show up on the leaves. This afternoon, we finally brought our Christmas tree indoors, and its fresh aroma has begun to fill our home with that special fragrance of Christmas. I hope to get lights on it later this evening. But these last days before Christmas are full ones. The beauty of our Solstice blossoms invites us to slow down; to appreciate the beauty, and not get completely lost in the flurry of endless tasks and errands. Direct wormhole back to Source. Nature’s way brings elements of the natural world together into relationship. 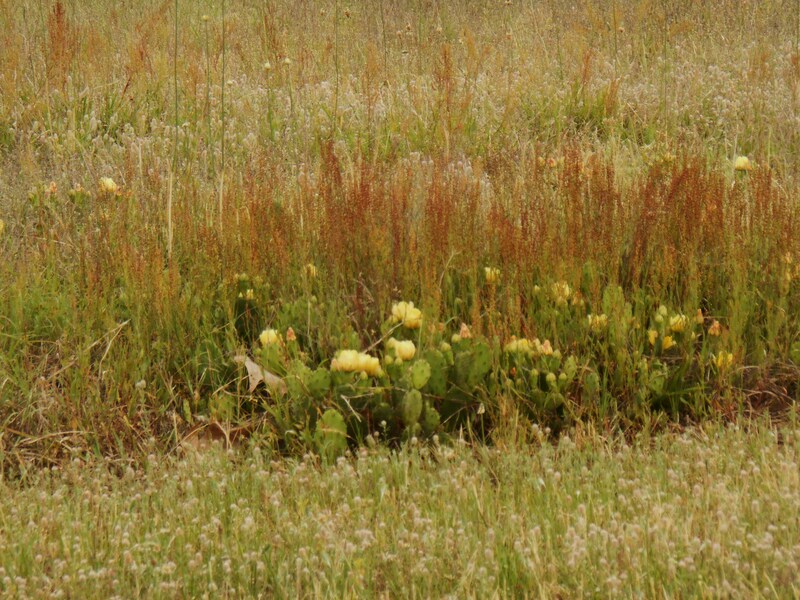 Prickly pear cactus growing in a field beside the Colonial Parkway with assorted grasses and Aliums. It is our human sensibility which wants to bring order from the “chaos” of nature by sorting, classifying, isolating, and perhaps eliminating elements of our environment. 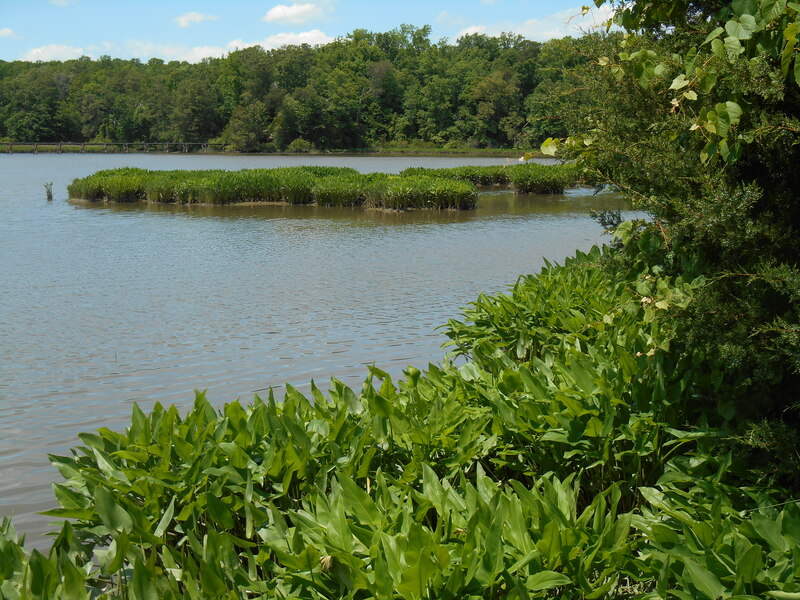 Pickerel weed, cattails, and grasses growing from the mud in a waterway on Jamestown Island. Nature teaches the wisdom of strength through unity and relationship. 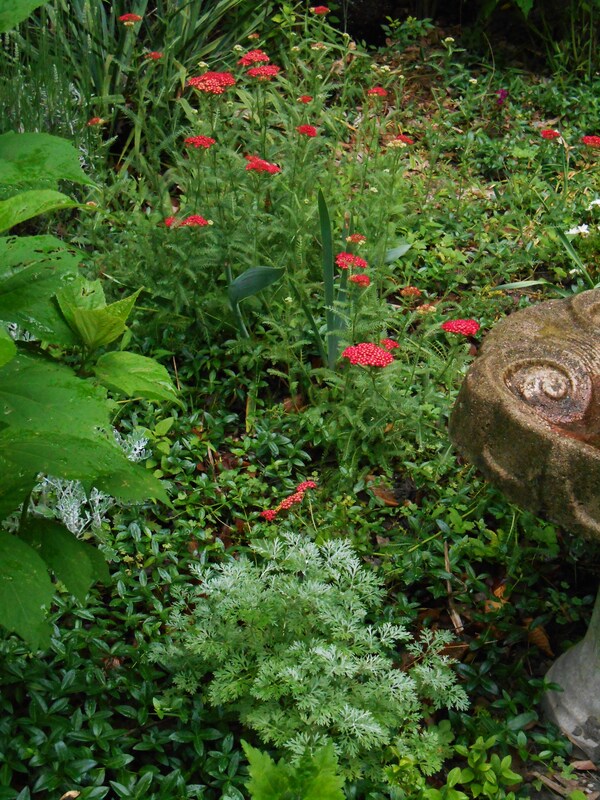 Gardens in medieval Europe were often composed primarily of lawns, shrubs, and trees. 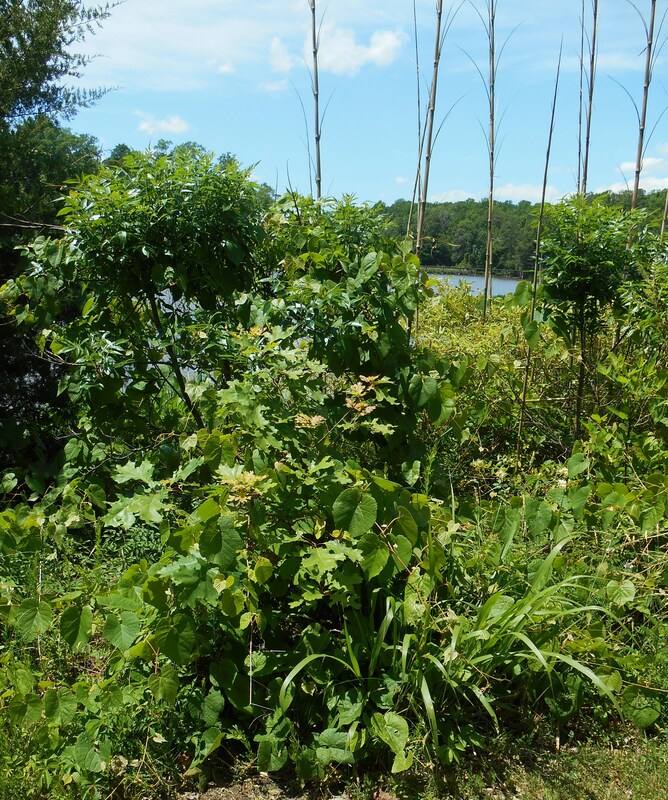 A similiar group of plants growing along the edge of College Creek in James City County, Virginia. This is still fashionable in American gardens today. But it is a high maintenance and sterile way to garden. I won’t bore you with a re-hash of the arguments for and against lawns… but will only say that wildflowers of all sorts find a home in ours. White clover growing with purple milk vetch and other wild flowers and grasses on the bank of a pond along the Colonial Parkway near Yorktown, Virginia. And I’m not an advocate of allowing every wild plant to grow where it sprouts, either. There are some plants which definitely are not welcome in our garden, or are welcome in only certain zones of it. Wild grapes grow on this Eastern Red Cedar beside College Creek. Do you see the tiny cluster of grapes which are already growing? Grapes grow wild in our area, but many pull the vines, considering them weeds. But in general, I prefer allowing plants to grow together in communities, weaving together above and below the soil, and over the expanse of time throughout a gardening year. 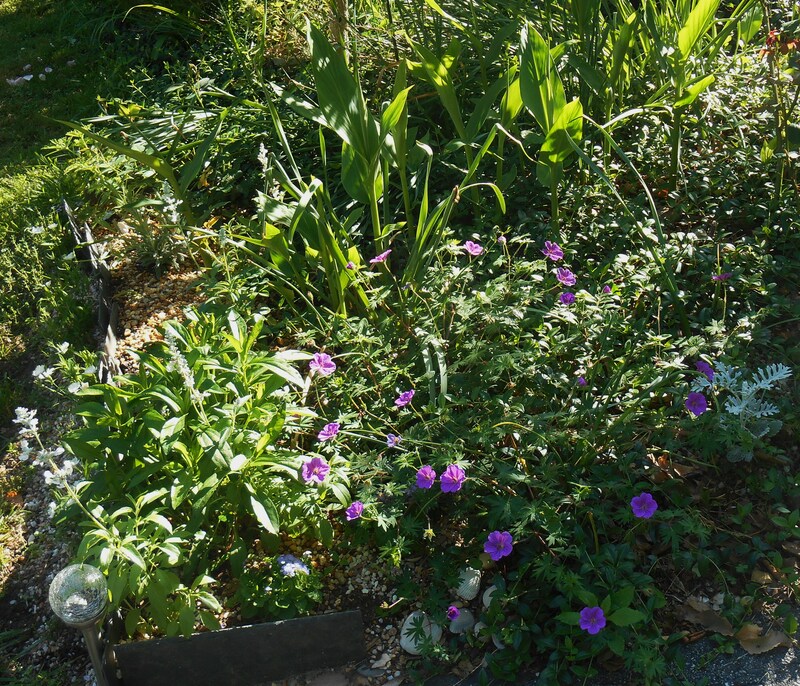 Perennial geranium and Vinca cover the ground of this bed of roses. 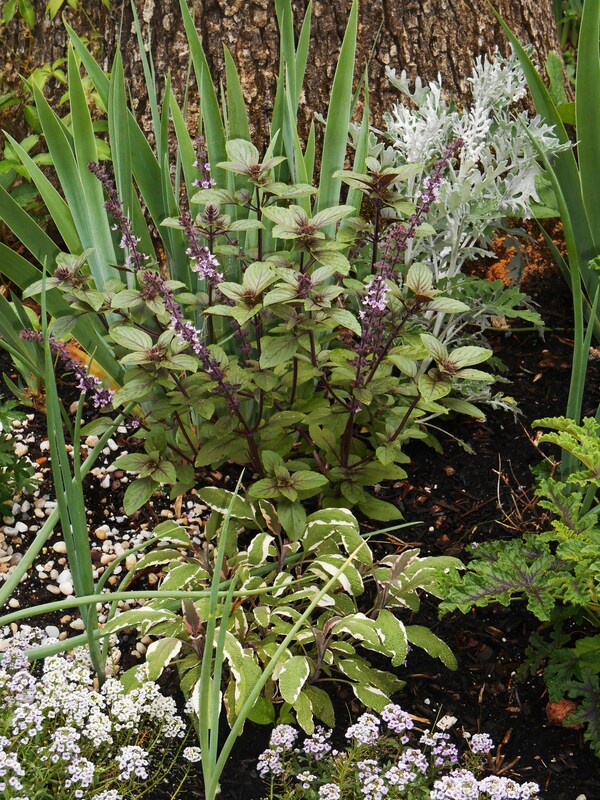 Young ginger lily, white sage, dusty miller, Ageratum, and a Lavender, “Goodwin Creek” share the bed. 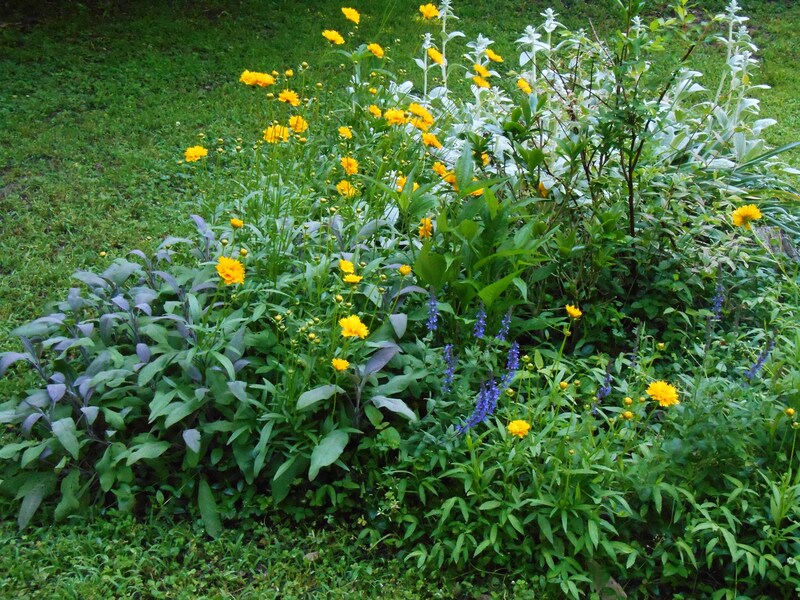 A simple example would be interplanting peonies with daffodils. As the daffodils fade, the peonies are taking center stage. 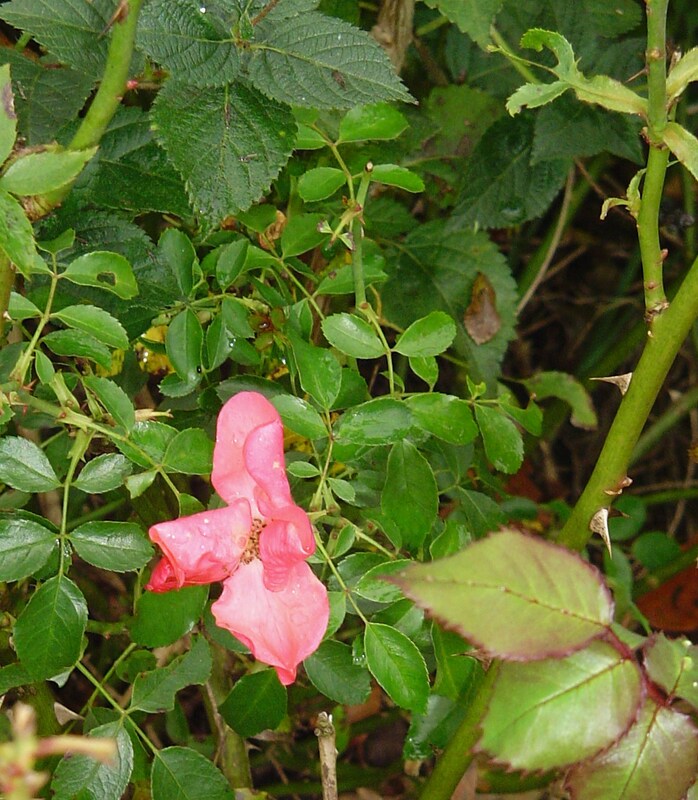 Another example is allowing Clematis vines to grow through roses; or to plant ivy beneath ferns. Japanese Painted Fern emerges around spend daffodils. Columbine, Vinca, apple mint and German Iris complete the bed beneath some large shrubs. Like little children hugging one another as they play, plants enjoy having company close by. 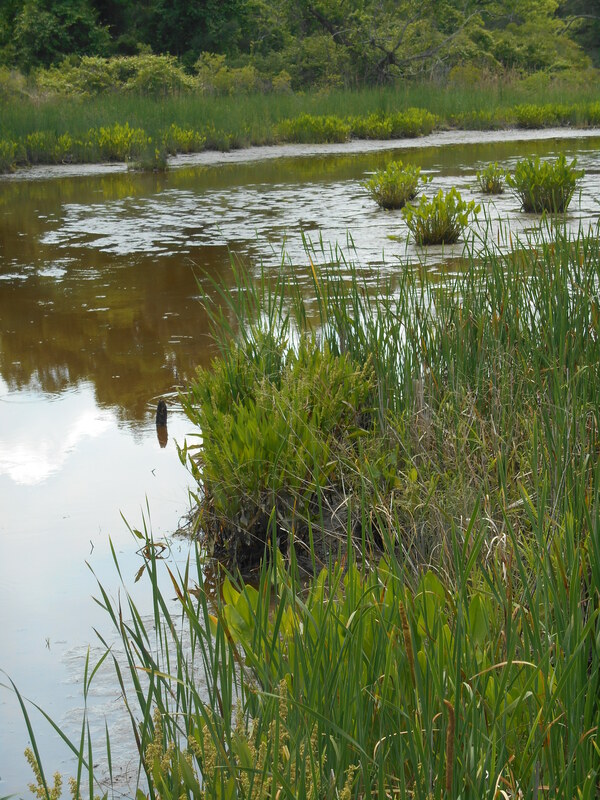 When you observe nature you will see related plants growing together in some sort of balance. 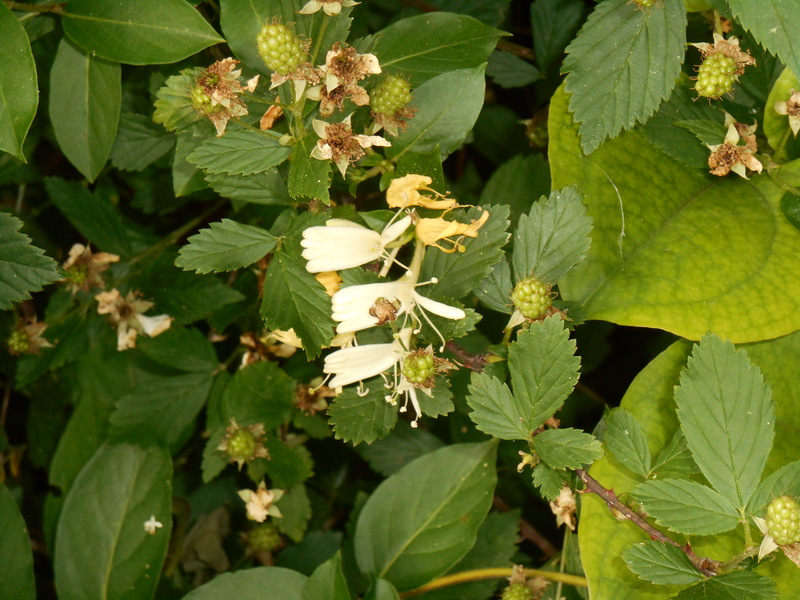 Honeysuckle and wild blackberries are both important food sources for wildlife. 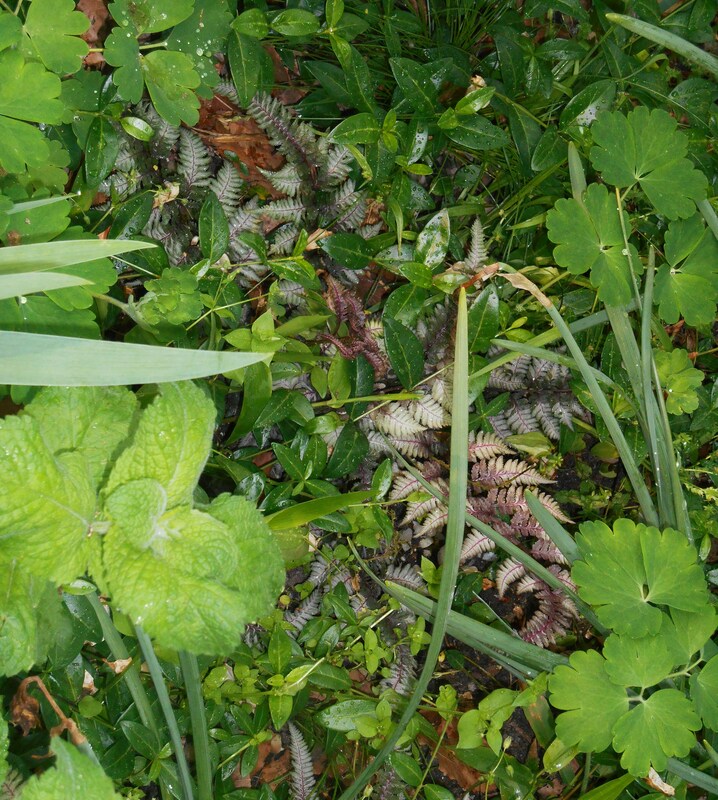 And you’ll find wild life of all descriptions interacting with the plants as part of the mix. 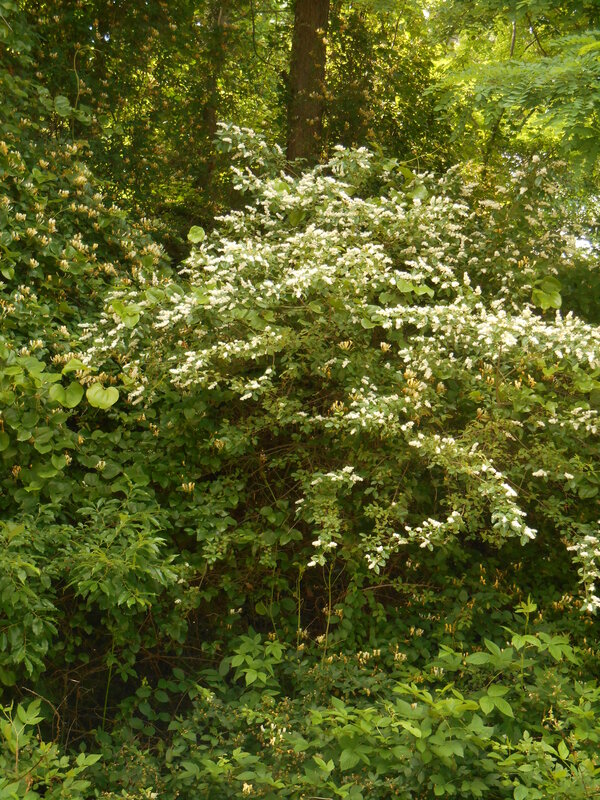 The blackberries and honeysuckle are scampering over and through a collection of small trees and flowering shrubs on the edge of a wooded area. All provide shelter to birds. The aroma of this stand of wildflowers is indescribably sweet. When planning your plantings, why not increase the diversity and the complexity of your pot or bed and see what beautiful associations develop? 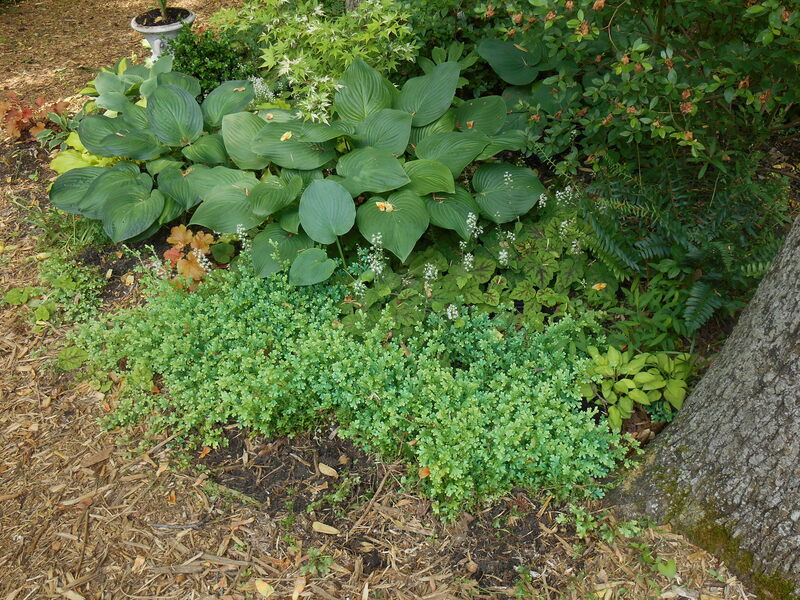 Herbs filling in our new “stump garden.” Alyssum is the lowest growing flower. 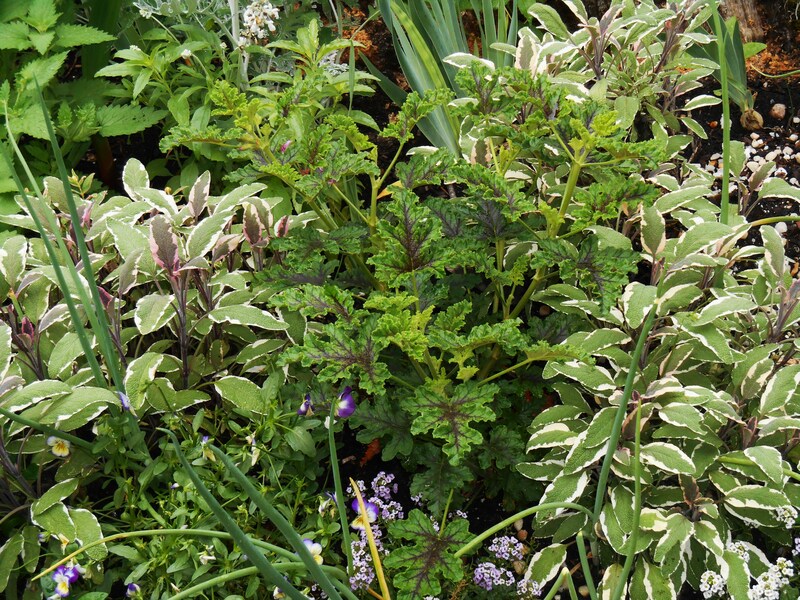 Tricolor Sage, Rose Scented Geranium, Violas, White Sage, Iris, and Catmint all blend in this densely planted garden. Now please don’t think that Woodland Gnome is suggesting that you leave the poison ivy growing in your shrub border. 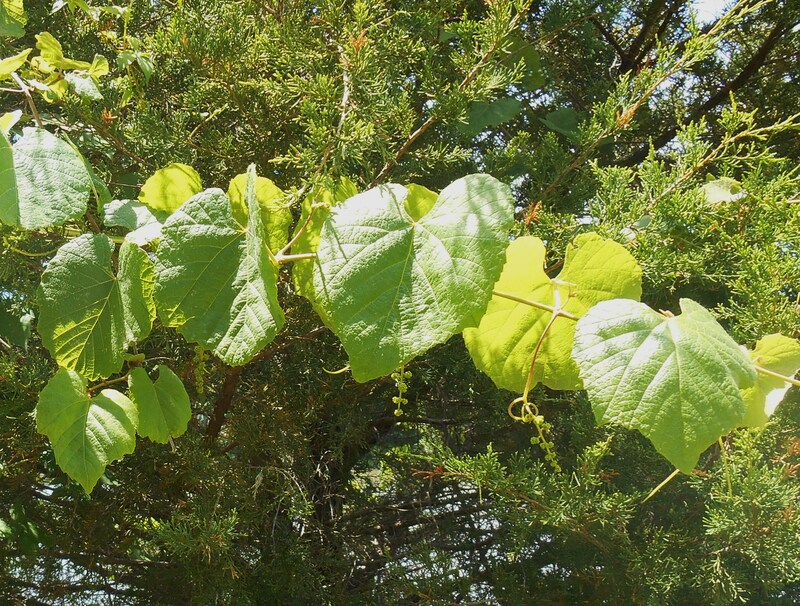 Although poison ivy is a beautiful vine and valuable to wildlife, our gardens are created for our own health and pleasure. So we will continue to snip these poisonous vines at the base whenever we find them. Another view of the “stump garden” planting. Here African Blue Basil has begun to fill its summer spot in front of Iris and Dusty Miller. But what about honeysuckle? 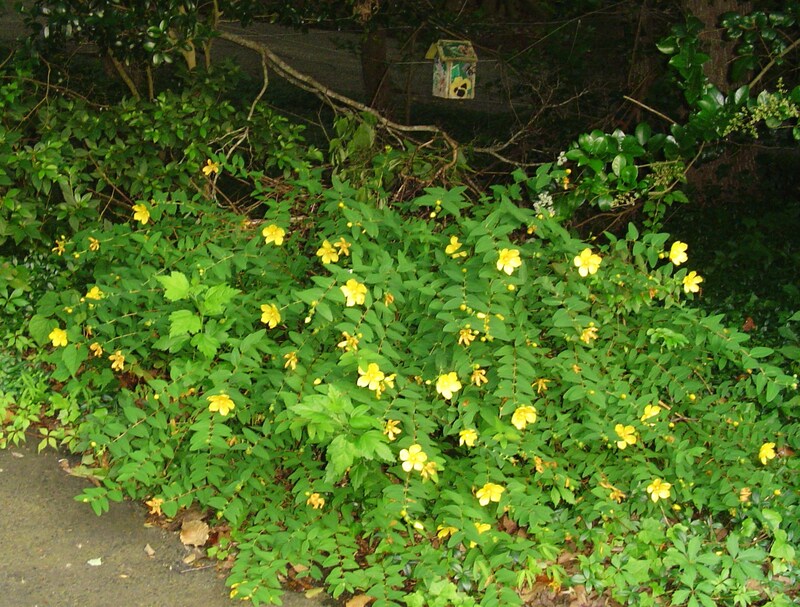 Is there a “wild” area where you can allow it to grow through some shrubs? 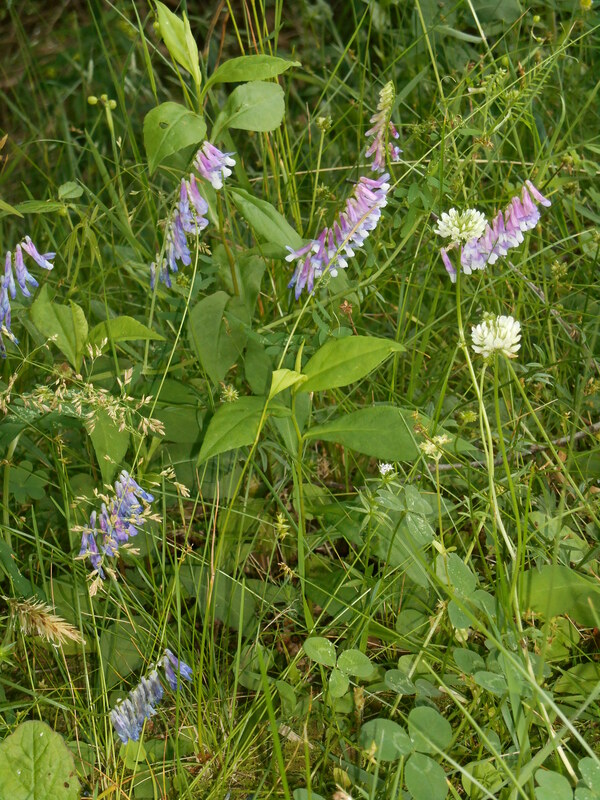 Can you tolerate wild violets in the lawn? 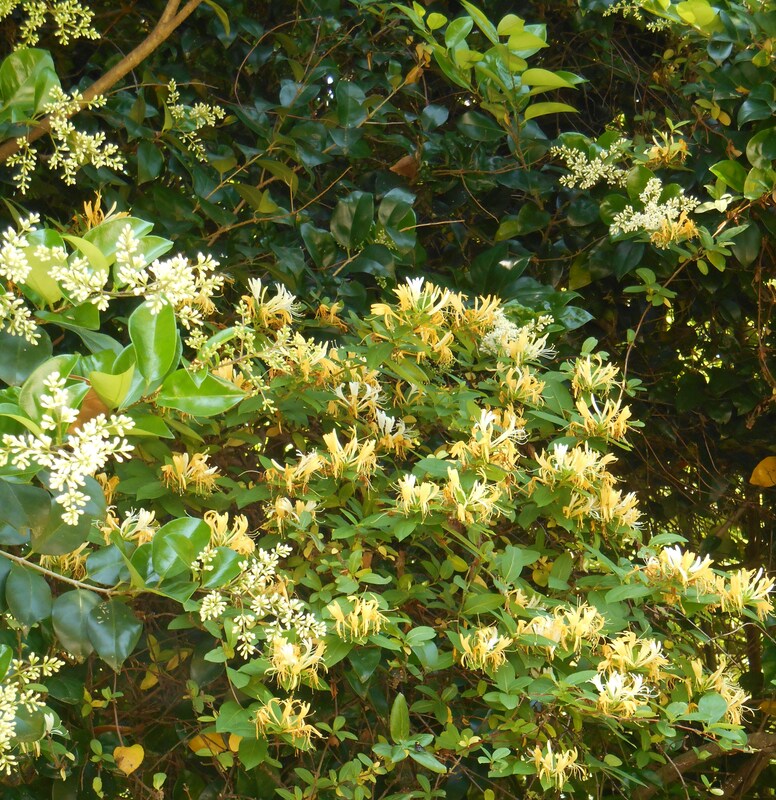 Honeysuckle blooming on Ligustrum shrubs, now as tall of trees, on one border of our garden. The fairly well known planting scheme for pots of “thriller, filler, spiller” is based in the idea that plants growing together form a beautiful composition, a community which becomes greater than the sum of its parts. 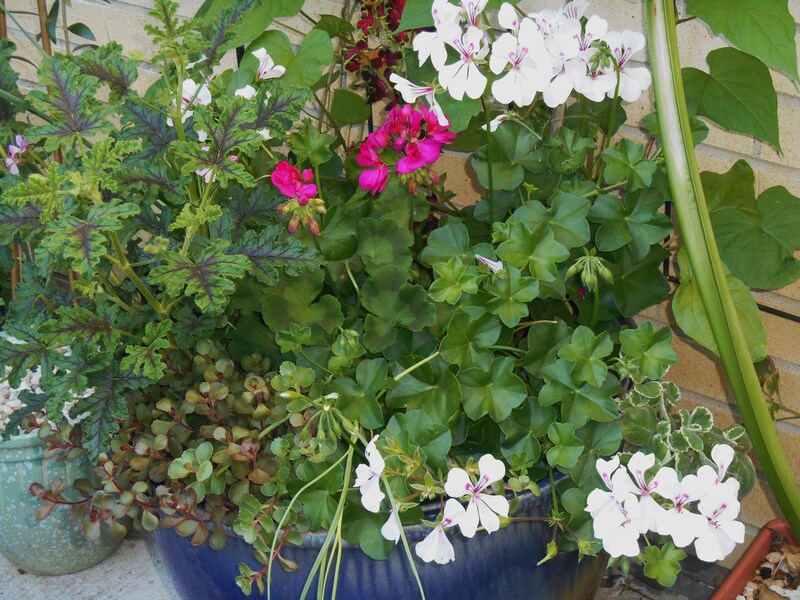 Three varieties of Geranium fill this pot in an area of full sun. Sedum spills across the front lip of the pot. 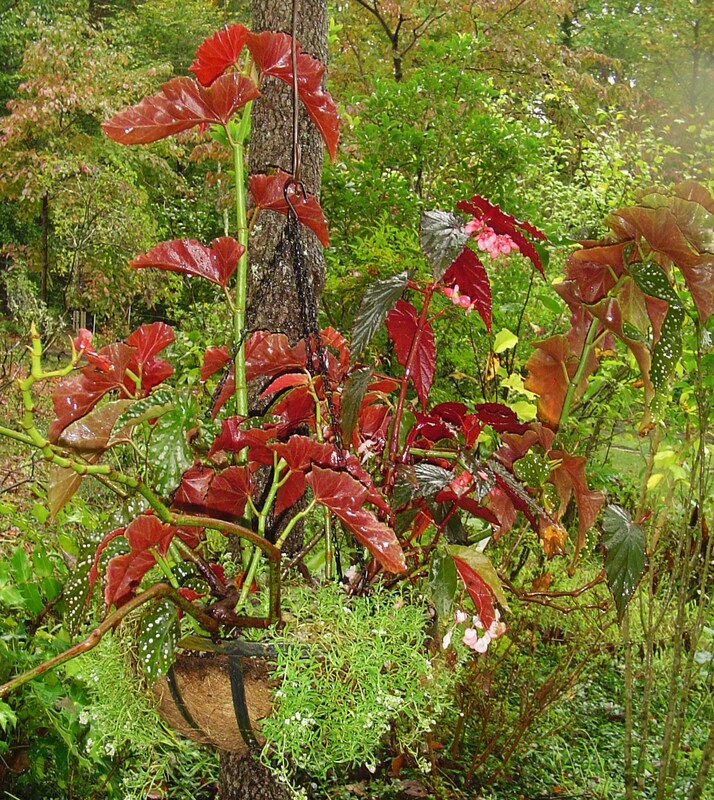 A bright Coleus grows along the back edge, and Moonflower vines climb the trellis. 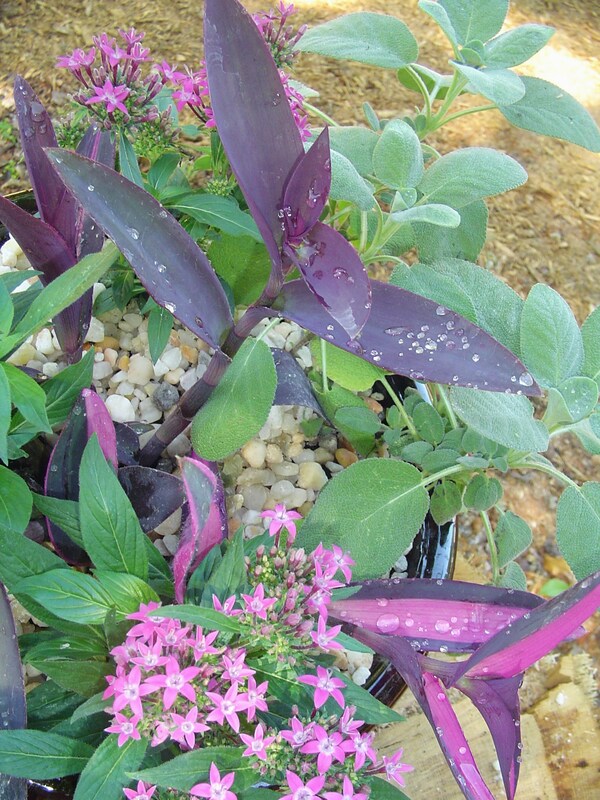 I like planting several plants in a relatively big pot; allowing room for all to grow, but for them to grow together. Geraniums, Coleus, Caladium, and Lamium fill this new hypertufa pot. This photo was taken the same evening the pot was planted. It will look much better and fuller in a few weeks. This is a better way to keep the plants hydrated and the temperature of the soil moderated from extremes of hot and cold, anyway. But this also works in beds. Two different Sages, Coreopsis, and Lamb’s Ears currently star in this bed, which also holds daffodils, Echinacea, St. John’s Wort, and a badly nibbled Camellia shrub. The Vinca is ubiquitous in our garden, and serves an important function as a ground cover which also blooms from time to time. The grasses growing along the edge get pulled every few weeks to keep them in control. 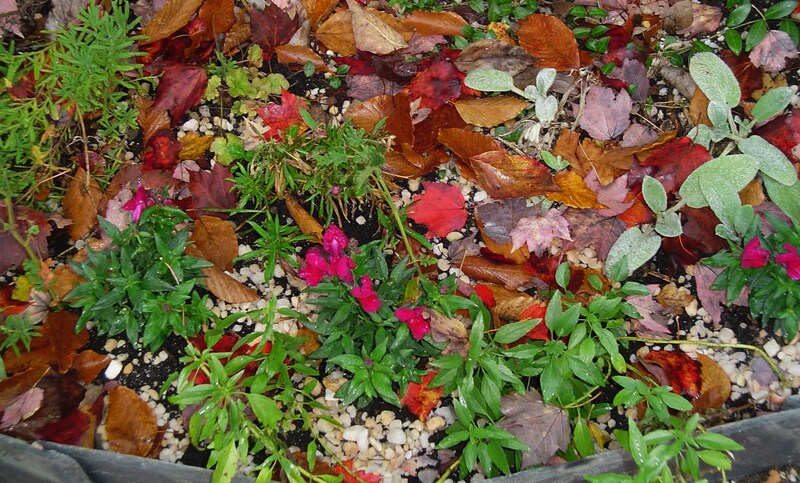 Choose a palette of plants, and then work out a scheme for combining a repetitive pattern of these six or ten plants over and again as you plant the bed. 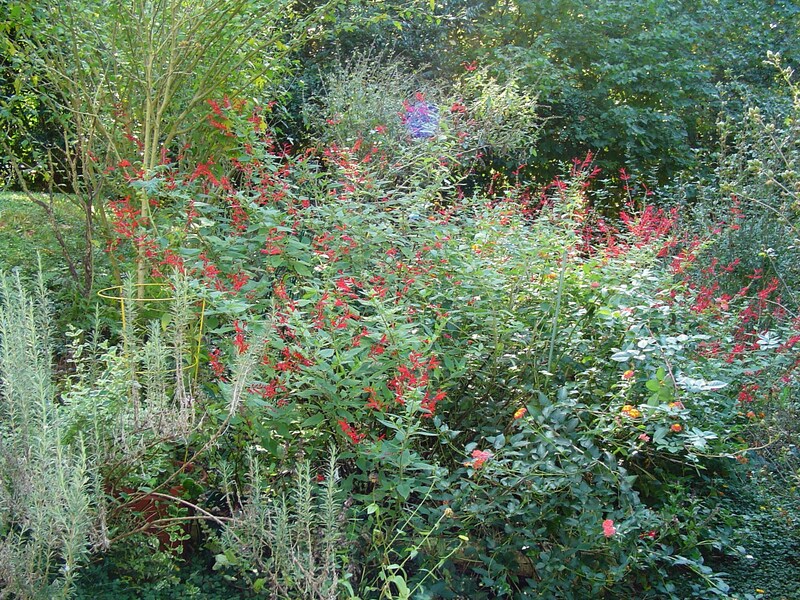 Include plants of different heights, growth habits, seasons of bloom, colors and textures. So long as you choose plants with similiar needs for light, moisture, and food this can work in countless variations. A wild area between a parking lot and College Creek. Notice the grape vines growing across a young oak tree. Trees are nature’s trellis. Bamboo has emerged and will fill this area if left alone. Beautiful yellow Iris, Staghorn Sumac, pink Hibiscus and Joe Pye Weed grow in this same area. 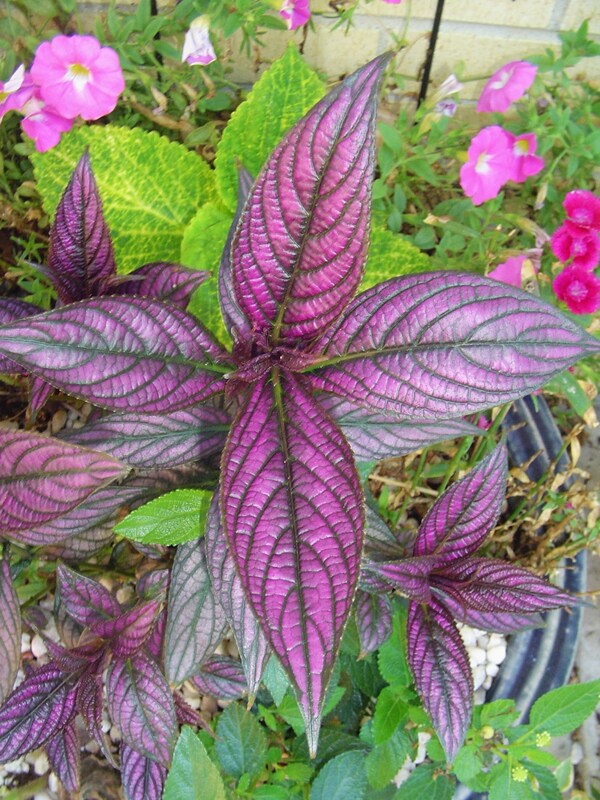 This is Nature’s way, and it can add a new depth of beauty to your garden. It can also make your gardening easier and more productive. It is important to observe as the plants grow. If one is getting too aggressive and its neighbors are suffering, then you must separate, prune, or sacrifice one or another of them. 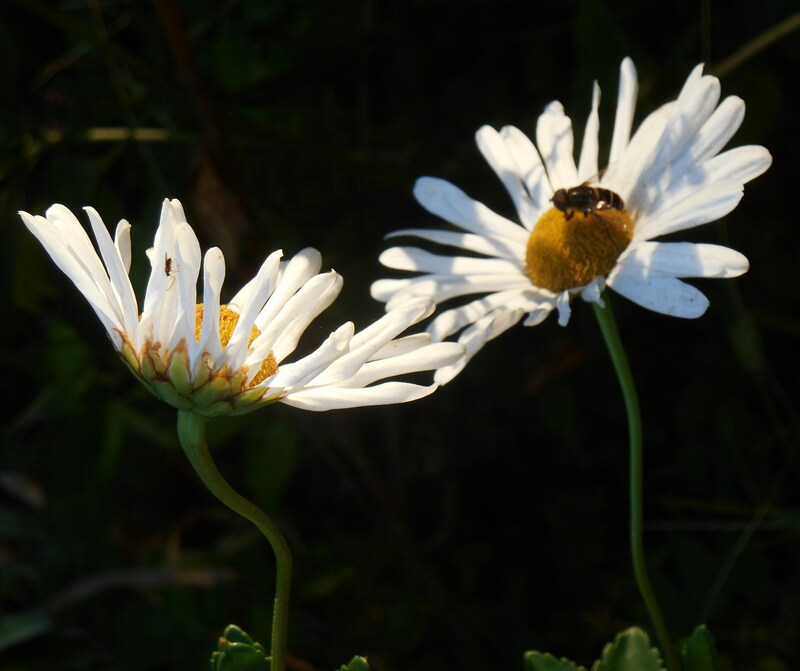 Planting flowers near vegetables brings more pollinating insects, increasing yields. 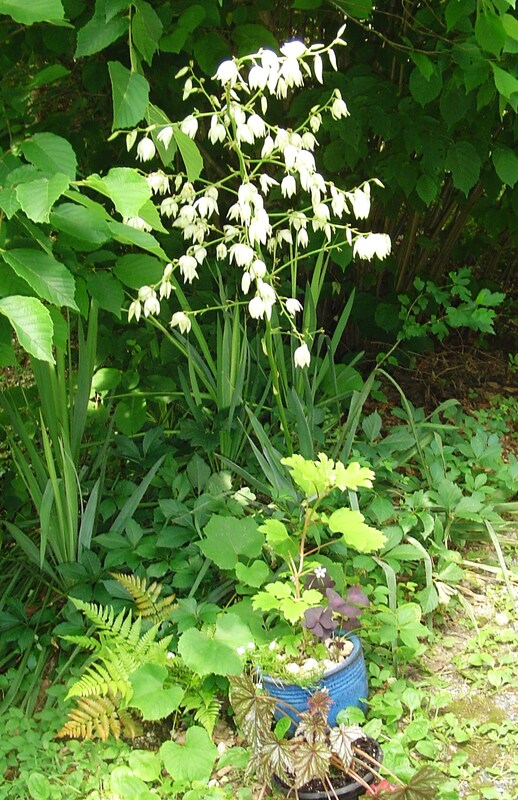 Planting garlic or onions among flowers has proven effective in keeping deer and rabbits away from my tasty flowering plants. Planting deep rooted herbs such as Comfrey, Angelica, and Parsley near other plants brings minerals from deep in the soil to the surface for use by other plants. 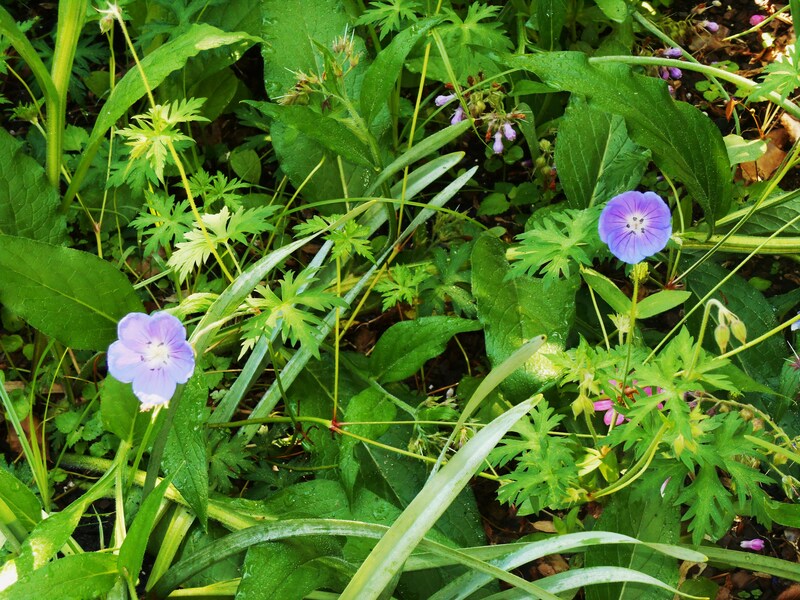 Perennial geranium growing here among some Comfrey. 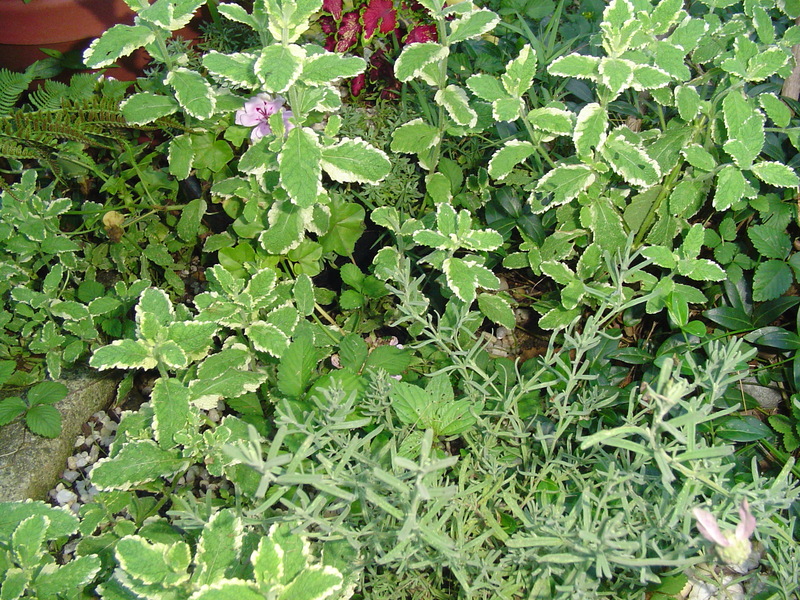 Use the leaves from these plants in mulch or compost to get the full benefit. Planting peas and members of the pea family in flower or vegetable beds increases the nitrogen content of the soil where they grow, because their roots fix nitrogen from the air into the soil. 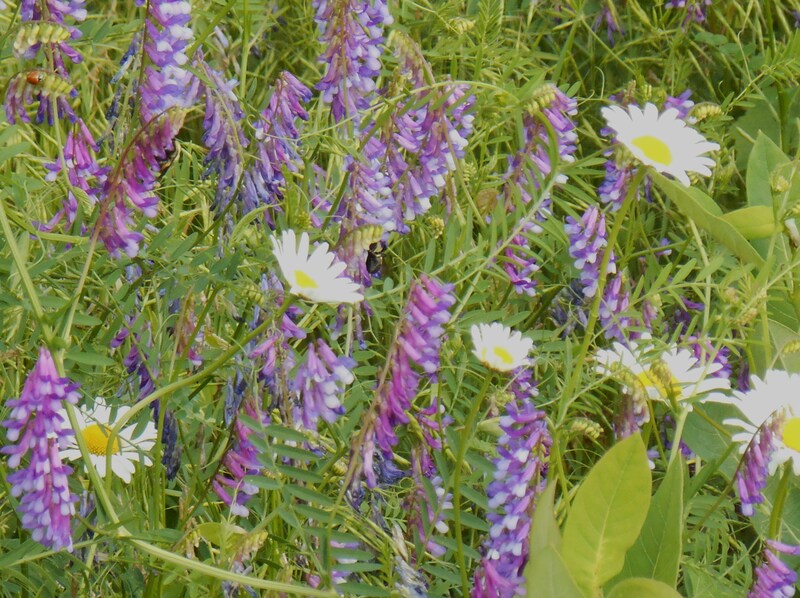 Purple milk vetch is one of the hundreds of members of the pea family. Planting Clematis vines among perennials or roses helps the Clematis grow by shading and cooling their roots. 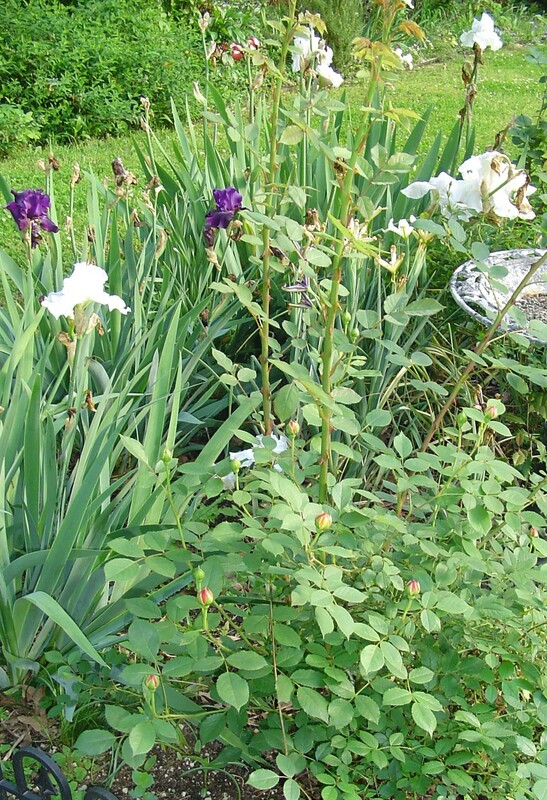 The Clematis will bloom and add interest when the roses or perennials are “taking a rest” later in the season. 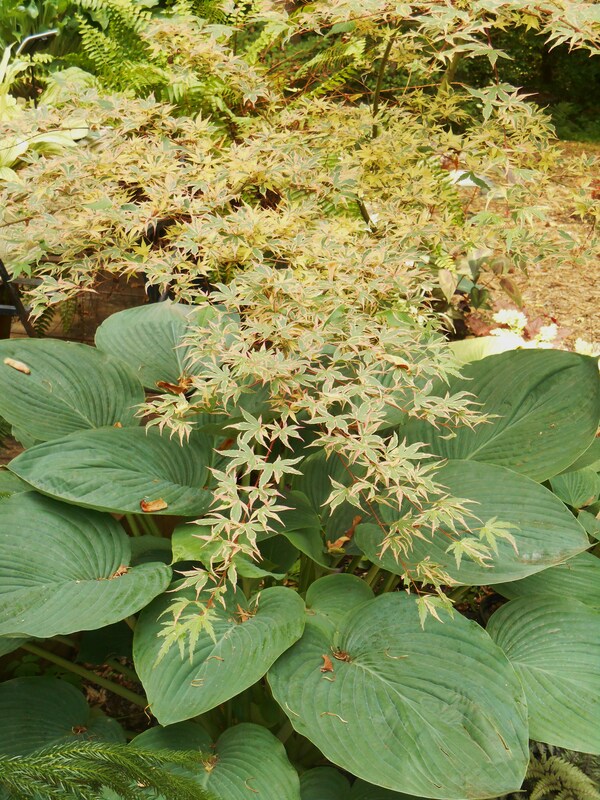 Japanese Maple shades a Hosta, “Empress Wu” in the Wubbel’s garden at Forest Lane Botanicals. Just as our human relationships are often based in helping one another, so plants form these relationships, too. The more you understand how plants interact with one another, the more productive your garden can become. 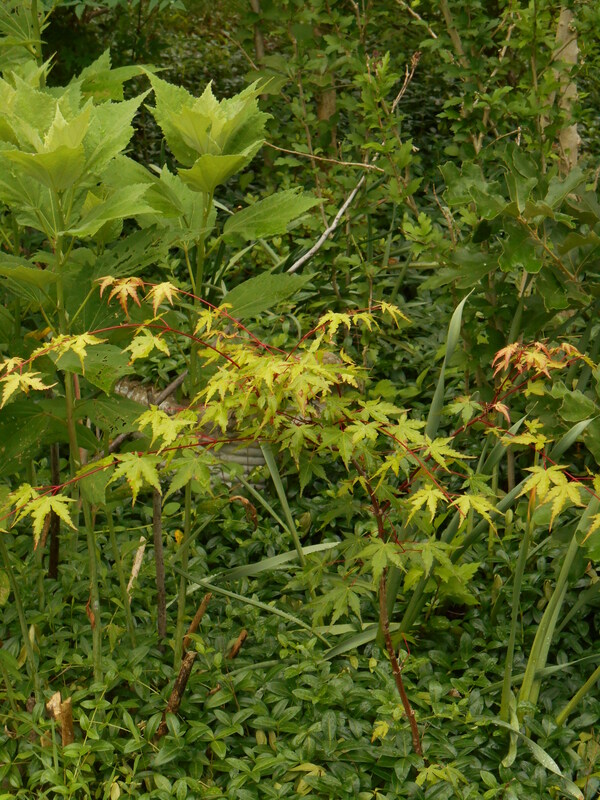 A “volunteer” Japanese Maple grows in a mixed shrub and perennial border in our garden near perennial Hibiscus. Forest Lane Botanicals display garden. C. Sasanqua, “Jingle Bells” unfolding its first blossom this year. We checked the weather forecast repeatedly today. On days like this, we just wish all of the local media weather people would get together on a conference call and work it out among themselves. Instead, we are hearing a different story on most every channel. And none of them see it the way the Weather Channel staff is calling it for the next week. 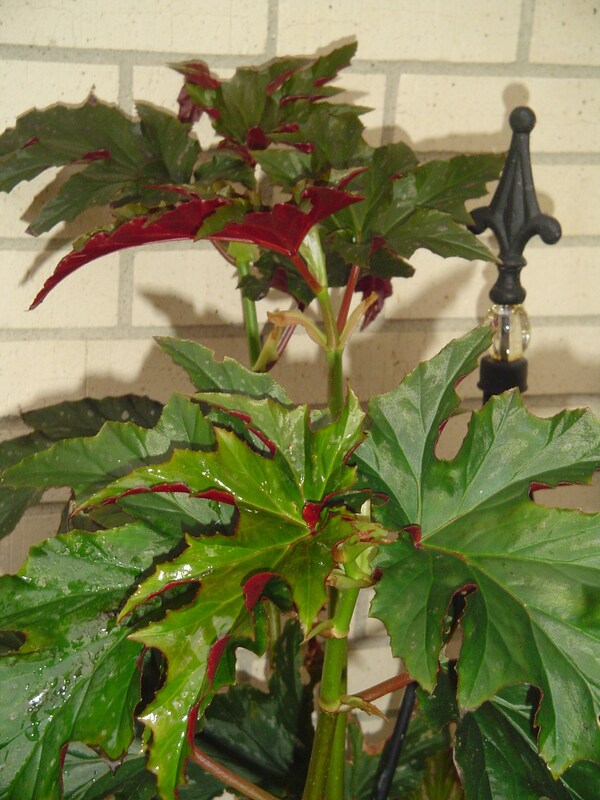 Time to finally bring this angel wing cane Begonia “Sophia” in for the winter. The day started with a weather report from my partner, and then a dash to the car to see whether the dashboard thermometers agreed with the TV’s “Locals on the 8s.” They didn’t. Why such concern? Most of our potted things were still outside soaking up the sunshine and gentle autumn rain. Please notice the past tense of that statement. We were hearing more than a 10 degree spread on the forecast for low temperatures tonight, depending on who we listened to. Not an issue for the Camellias, but definitely an issue for the Begonias. You see, we may have our first dip below 32F tonight, with wind from the northwest. That is a recipe for disaster for any annual or tender perennial abandoned to the elements over night. In fact, the weather maps on the 10 day forecast are filled with this huge blue field of cold high pressure air swooping down from Canada. Not only are we hearing, in minute detail, about the wintery temperatures on the way, we even heard them discuss the “S” word for next week. REALLY? We need to think about snow before Thanksgiving in coastal Virginia? Snaps will bloom happily outside all winter, and the lamb’s ears will green up in early spring with lush growth. So far, we’ve had roller coaster temps and Indian summer. It was 70F here yesterday. I’ve let the daytime sunshine balance out the early morning dips into the 40s or even high 30s, providing a little shelter for the tender potted things and hoping they could withstand the cool. So, with one eye on the monster typhoon crossing the Philippines, headed directly into Vietnam, where a dear friend is on a cruise with her extended family; the other eye was fixed on tonight’s forecast and the projected lows for the next several nights. And on the threat of snow. This cane Begonia, “Cracklin Rosie,” has grown huge outside. It was quite a challenge to get it inside with minimal damage. By noon the decision was made. 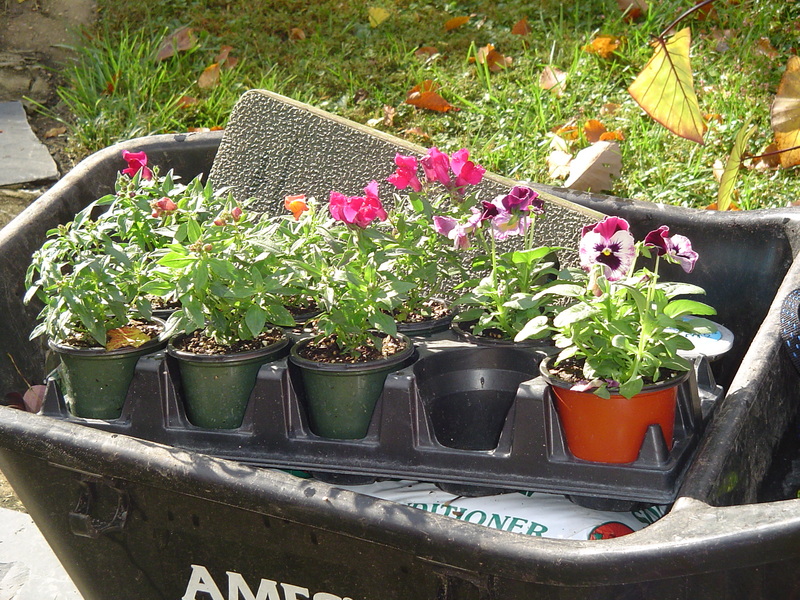 Today was the day to bring in any potted plant we’re not willing to see freeze. I was handed Latex gloves, and I accepted one for the “infected thumb hand.” Then I was handed gardening gloves. I could see this was going to be a big deal, but that I would have help. 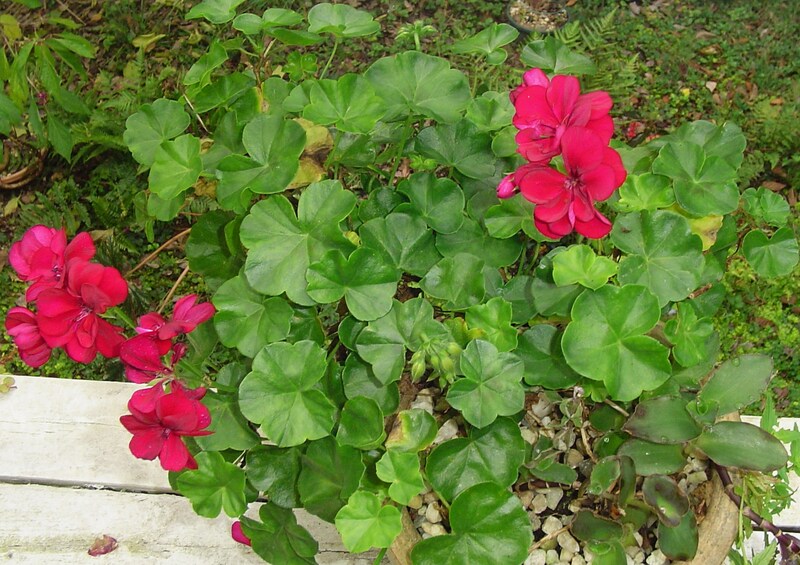 Ivy geraniums love the cool, but will freeze in the cold. This one came inside today. My allotted space in the garage, between the hot water heater, the washer, and the steps had already been outlined with dots of “Duck Yellow” paint. I had partially covered the area with a white plastic tablecloth, to better protect the floor this winter, days ago when the first of the Begonias came inside. Now it was finally time to match the right plastic saucer to the right plant in the right spot. Oh how I hate bringing the plants in. Not only do I hate bringing them in out of the sunshine they need; but I hate mucking with the muddy summer saucers, the fallen leaves stuck deep in the branches, and the occasional slug or snail clinging to pot or leaf. The baskets and pots are heavy and awkward. Worse, I hate seeing bits broken off as we move them from deck or patio to narrow doorway to their allotted winter spot. It is a very messy operation. But I would hate watching them die in the cold so very much more. The Bougainvillea is still outside tonight. We’ll need to bring it in before it snows. We carefully calculate the timing for each plant. How much cold can it stand? What if we shelter it close to the house under the eaves? How likely is it to warm up again? How well will it fare inside for five months, and what will it look like by spring? 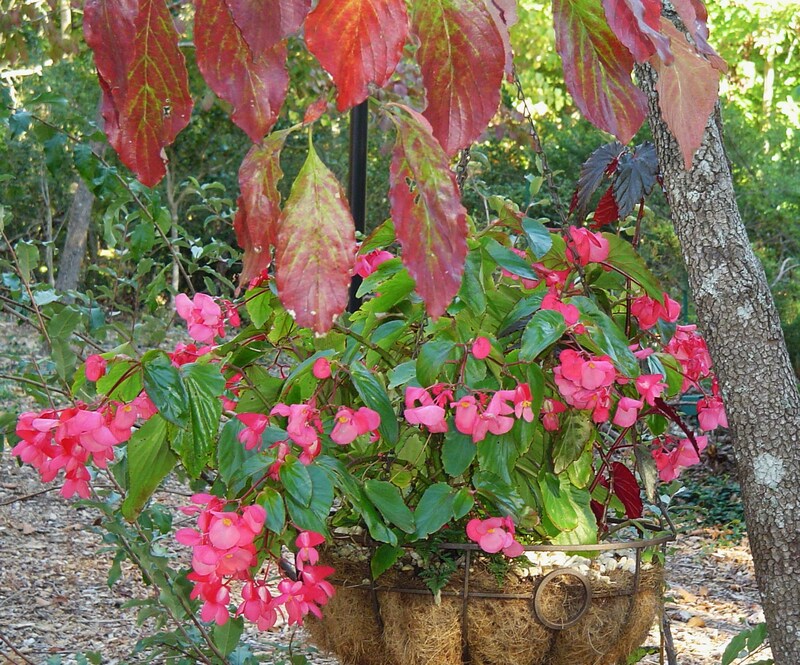 Dragon wing Begonias will wither when they freeze. They root easily from cuttings, so one saved plant can yield many for spring. There isn’t enough room for all of them, but we get very creative to save as many as we can. Hanging baskets stand in empty five gallon buckets. Others sit in combinations of plastic trays to both support them and catch the inevitable drips from watering. Some we keep mainly for late winter cuttings, others we know will soon go dormant and won’t need much light. The choicest come inside to the living room, the rangy stay in the garage. It amazes me to see how huge some of the Begonias have grown this summer. Two of the canes stand taller than either of us, and we aren’t small people. They look so much bigger now that they are inside. 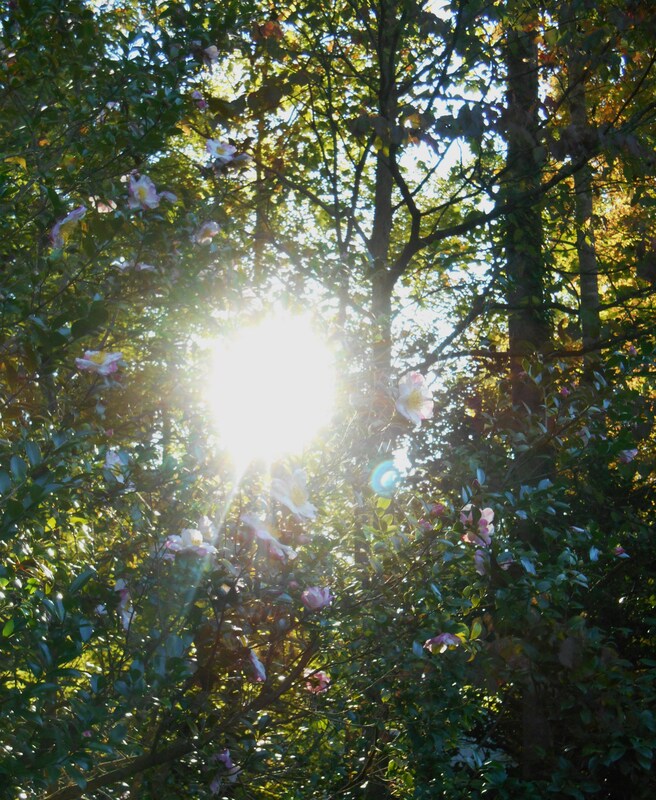 They fill the allotted space with a dense forest of leaf, bloom, and branch. A friend recently asked whether I’d considered getting a greenhouse. The answer is a resounding, “Yes!” but so far that hasn’t been an option. There is no good place to site it here where falling trees or limbs wouldn’t be a constant worry. The cane Begonias look so much larger inside. So we appreciate our bright garage with windows to let in the winter sunlight. We appreciate our bright living room with space to line up the pots like obedient elephants in a circus. We appreciate the windowsills wide enough for little pots of orchids and cyclamen, and the good light we receive on bright days. Our entire home becomes a greenhouse from November through April. 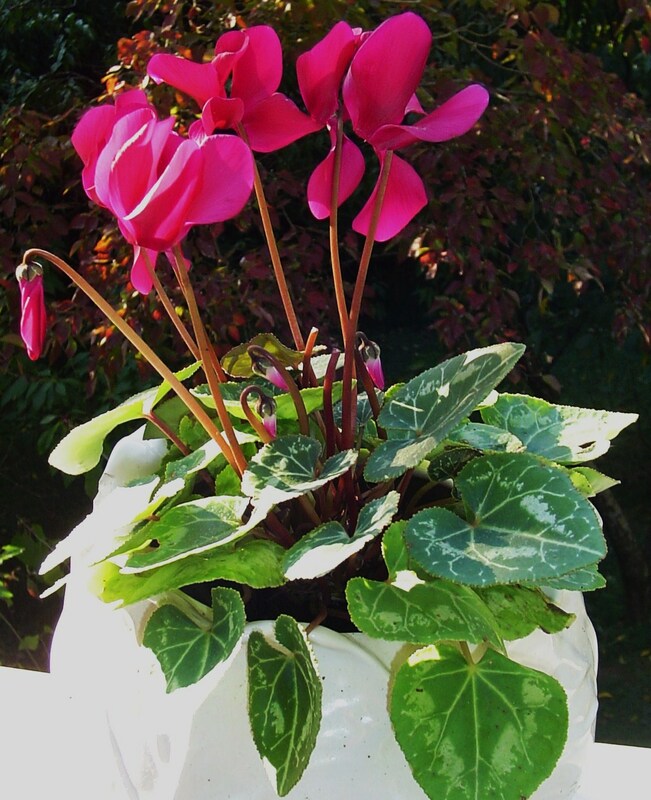 Cyclamen love the cool autumn, but must come in before a freeze. Late this afternoon, when most of the moving was finished and I was soaking the thumb before fixing us some lunch, I found a missed call from a cherished friend. I returned her call and learned she had “a few things” she wanted to drop off for us. She had some candles, some magazines, a lent plate to return…. We told her to come on by. Along with the cardboard carton came a shopping bag- holding a gorgeous asparagus fern. She didn’t have enough light to keep it through the winter, and she knew we’d find a bright spot for it. It is lovely, and I have an empty pot in mind…. Our asparagus fern in its new pot. A week into November, and winter is closing in. Like most serious gardeners, when I get a little “ding” I generally just keep on going and choose to ignore it. That’s probably why I have absolutely no idea how I injured my thumb last week. I get lots of dings between work in the garden and the kitchen. They almost always heal right up and I stay in motion. One of the best values of the home pharmacy! This thumb injury, right where the nail meets the skin, started out that way. But, I made the cardinal mistake of working outside without gloves over the weekend. Add in all of the dish washing, and general cleaning up, and I exposed the little nick in my skin to some nasty bacteria somewhere along the way. It was sore on Saturday, worse on Sunday, but by yesterday it was throbbing as I typed. And it kept getting worse. If you’re like me, you do most of your own “doctoring” and avoid the AMA crowd whenever possible. Trying to remember all of the home remedies for infections, I remembered Epsom Salts. We try to keep some around all the time because it’s useful for so many things. Well, I finally found a carton in the garage next to the Plant Tone, covered in cobwebs and potting soil. Not exactly sterile looking. The last time I had used it was on the roses in early summer. By the time I realized that my whole thumb was red and throbbing, it was late in the day yesterday and I had no interest in heading to the store or the urgent care. A long soak in a bowl of hot water and dissolved Epsom salts finally brought some relief. Temporary relief that is. I went on the offensive with mega doses of vitamin C, topical antibiotic cream, and even some colloidal silver; which was the antibiotic of choice before the pharmaceutical industry made so many specific antibiotics available. A full assault on the nasty microbes attacking my thumb at least kept the infection from spreading any more, and we got a few hours of sleep here and there. You can feel the pain draining away during an Epsom salt soak. Whether we’re talking tired muscles, infected finger, or any of a number of other maladies; Epsom salt is a powerful healing agent. It can penetrate through the skin, across the cell membranes, to bring healing and draw out toxins. Soaking for 20 to 30 minutes, every four hours or so, made a huge difference. 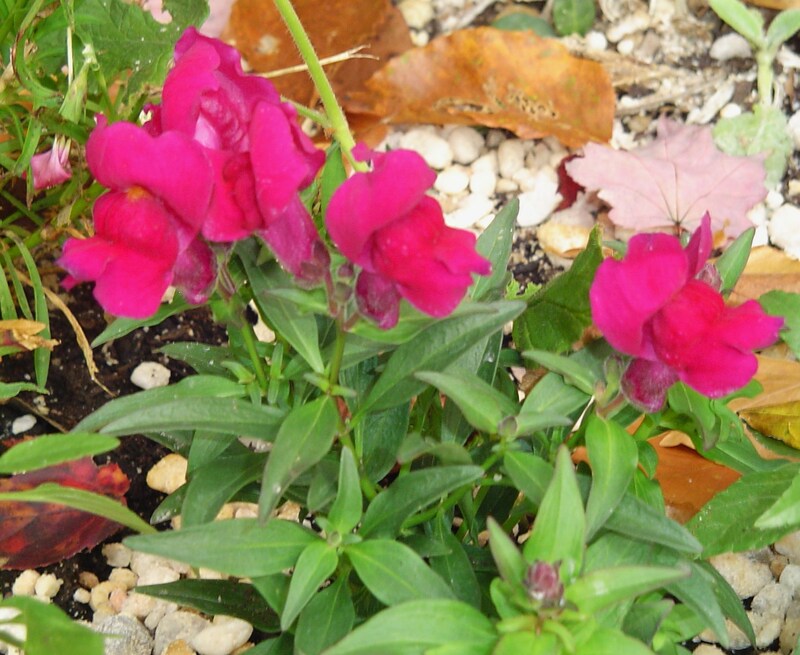 Snapdragons from Homestead Garden Center, grown by the Patton family, moved into their new bed on Saturday morning. Given no other option, the finger might have healed up in a few days with the healing protocol I’d started. But I’ve read too many stories lately about fast moving infections, and by this afternoon decided to pay the price and get the script. The doc was great, except for the forceps under the nail to make sure nothing was still lodged there. AND, she told me that she would have suggested the Epson salts soak had I not already initiated it. So, with the antibiotic coursing through my system I’m beginning to feel better, but will keep soaking the thumb until at least tomorrow. 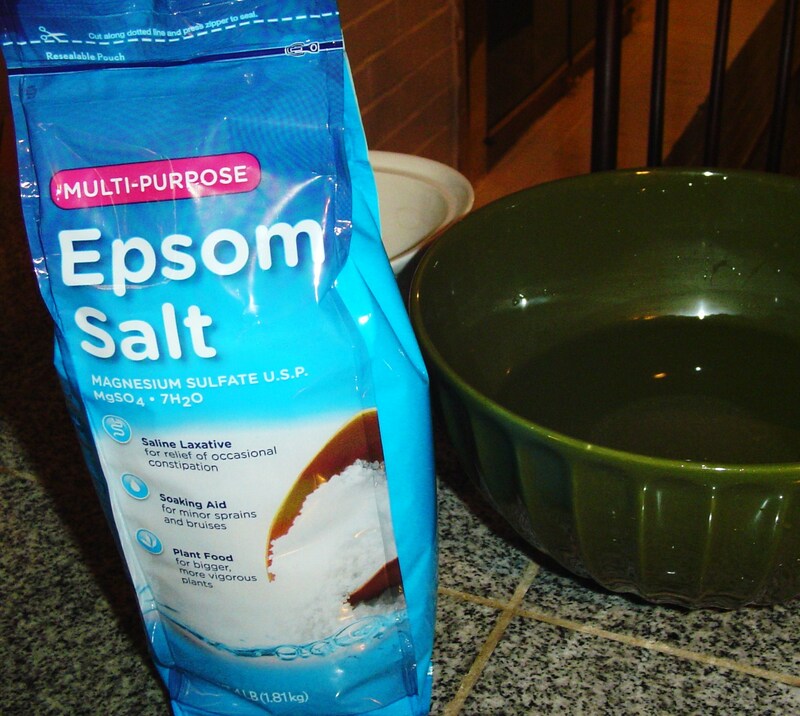 Do you have Epsom salts in your pantry? It is basic equipment for a serious gardener. It, along with pure water, is as good for the gardener as it is for the garden! What have I learned from this little misadventure? It always pays to reflect and tote up the lessons to carry forward. 1. Always wear gloves when working in the garden. Protect the skin from nicks, and the nicks from the nasties in the soil. 2. Put a clean bandage and an alcohol wipe in the gardening vest, right next to the pocket knife. I’ve never done that, but will going forward. 3. Don’t ignore little injuries hoping they’ll go away. I don’t mean to sound like a wimp, but a little more care on the front end could have prevented this infection. 4. Spring for two packages of Epsom salts. Leave one in the garage with the plant foods, but keep another one in the pantry for healing. Tonight I’m still a nine fingered typist, but managed to get a few photos of the garden before dusk. 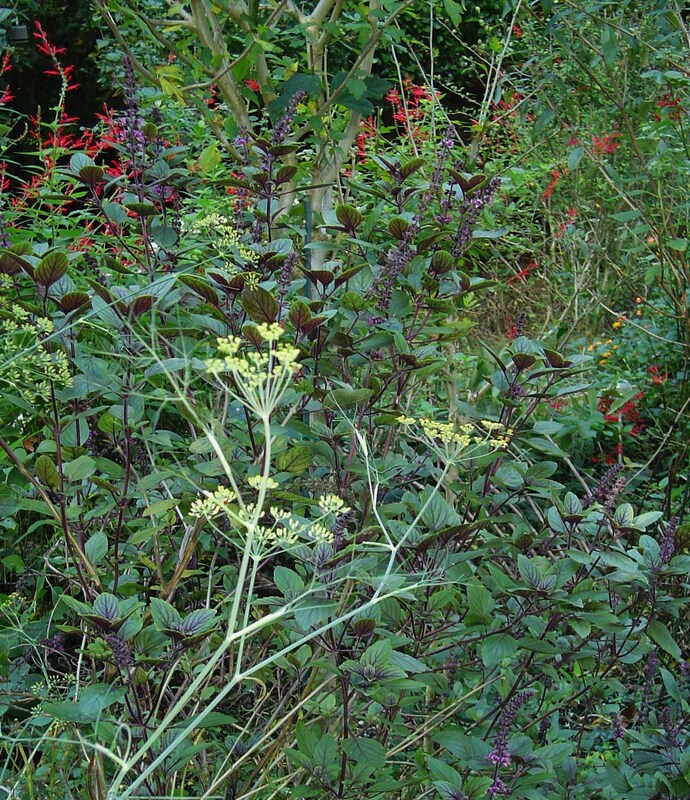 Here are Tuesday’s Snapshots from the forest garden. Will this be the last Zinnia of the season? The Lantana just doesn’t quit until it gets hit by a hard frost… or two…. 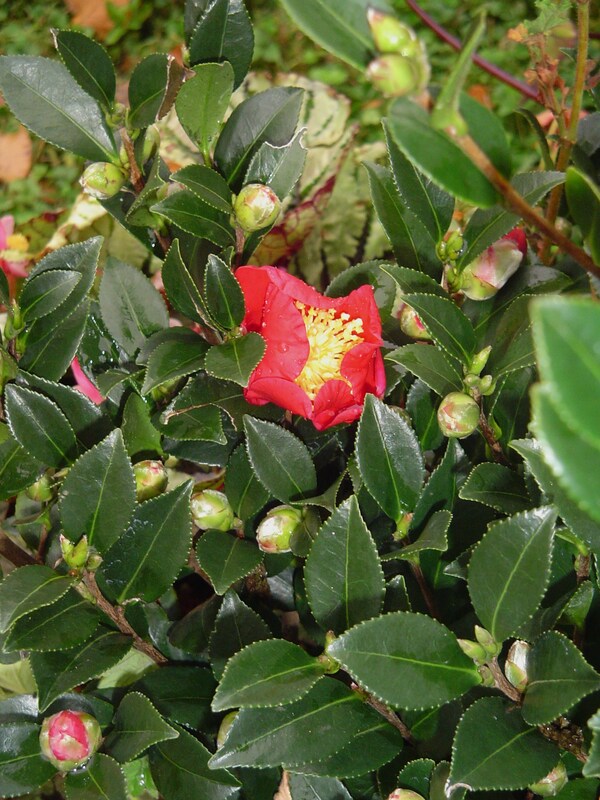 Our latest Camellia to bloom is a lovely shade of deep pink. The Panolas look happy in their new pot. 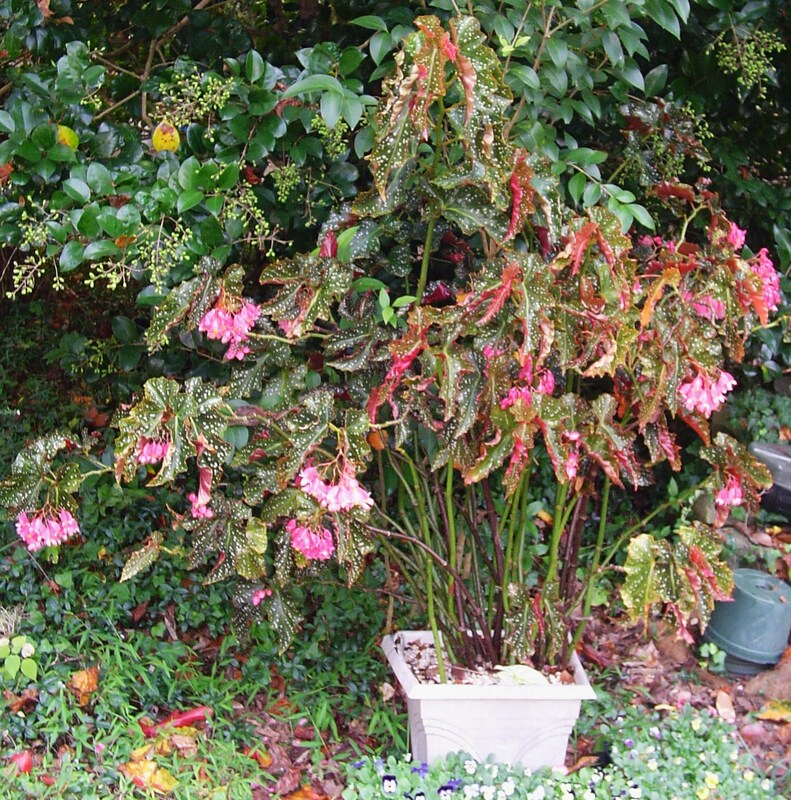 The Begonia under the azaleas loves the cooler weather. She’ll need to be dug soon to survive the winter. Stay well, be careful in the midst of all that gardening fun, and keep the first aid kit well stocked! PIneapple Sage, Pineapple Mint, Rosemary, and Lantana at their peak in late October. What a gorgeous day it’s been here in Williamsburg. 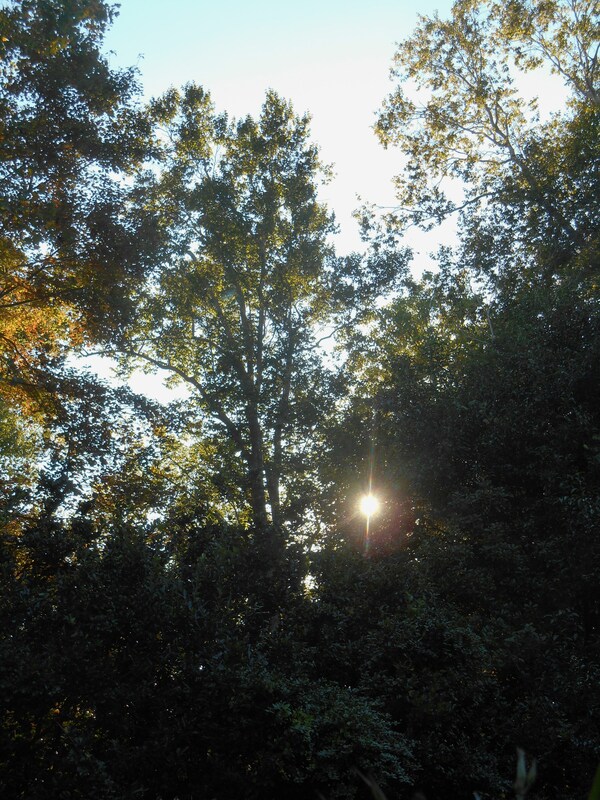 After our first really cold night, down into the 30s, the morning dawned clear and brisk. We’ve had cool wind all day and bright sunshine. It is that time of the year to watch the weather and decide what needs to come inside for the night. Will it freeze tonight? Can the Begonias stay outside another day? Dragon Wing Begonias love these cool bright days. I have areas prepared to bring everything in, and we even bought a number of fresh, clean plastic disks for bringing potted plants into the house for the winter. Everything is ready to go…. but the plants. It looks like they are loving this weather! It is a horticultural game of “chicken”, balancing the late night low temperatures against the chance to soak up another day of sunshine and fresh air. 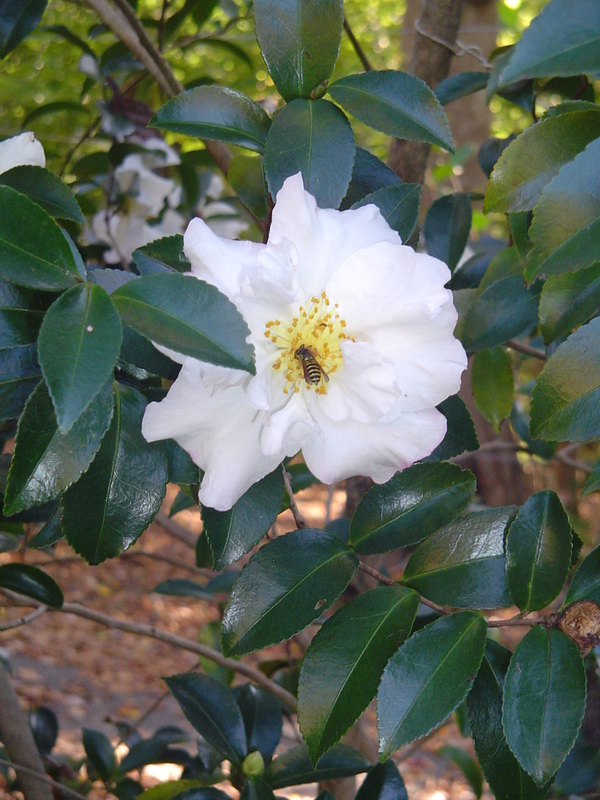 A tiny bee uses a Camellia as a “bed and breakfast” inn. We finally brought the Norfolk Island Pine in late last night after doing the research online to determine how much cold it can withstand: not much. If temps go back up next week it will go back out to its spot on the patio. Many of our Begonias are huddled together, out of the wind, where the house and patio will keep them insulated by a few degrees at least. We brought a few inside after watching the 5 PM weather- just to make sure a few have extra protection should it get even colder than the forecast. 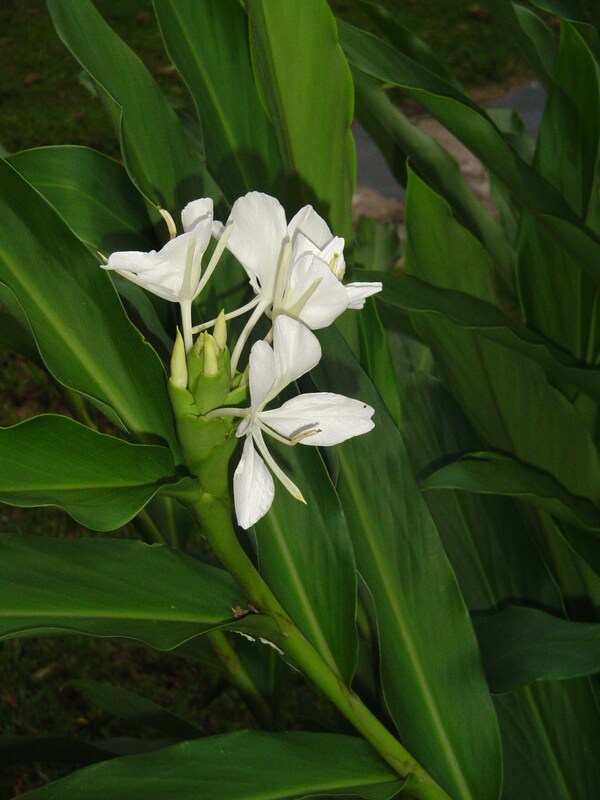 The Ginger lilies are covered in bloom. The flowers rooted into the Earth are taking the changes in stride. If anything, the Ginger lilies are giving more flowers than ever before. The Rosemary have broken out into bloom. 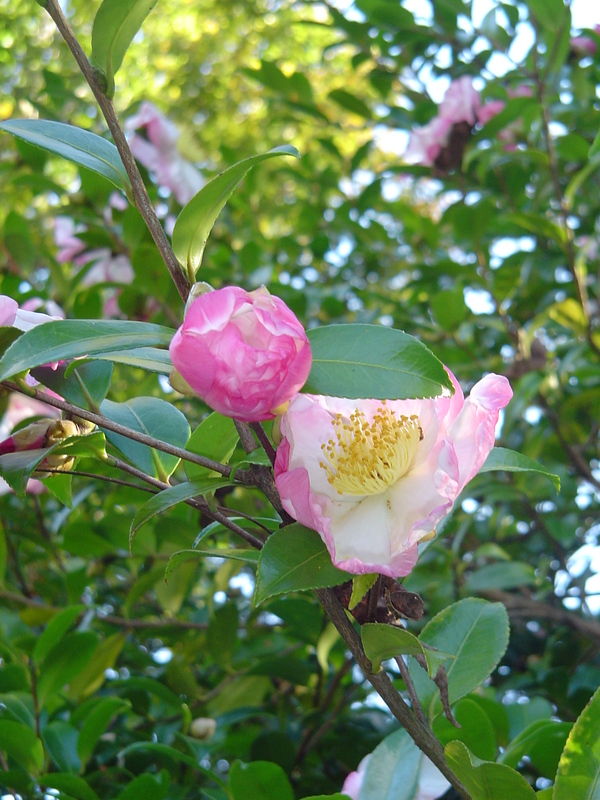 The Camellias unfold new buds each day, and give shelter to the tiny insects who come for their nectar. 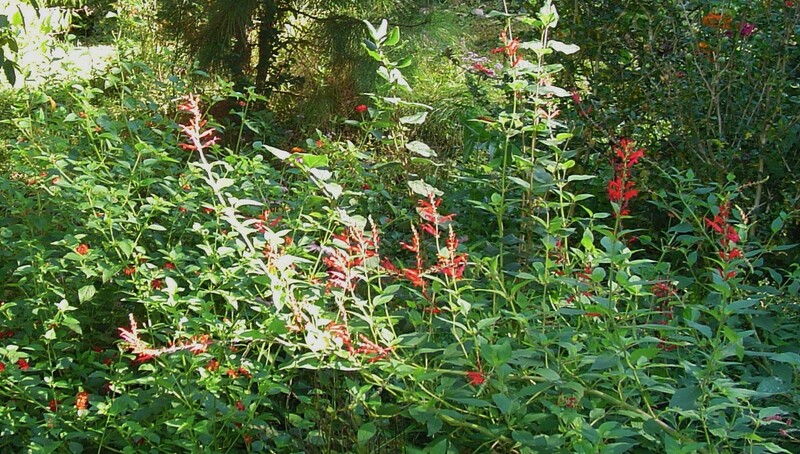 Pineapple Sage is at its peak, covered in scarlet, reaching for the sky. The Bouganvilliea finally bloomed, after a summer of waiting for flowers, at the end of September. 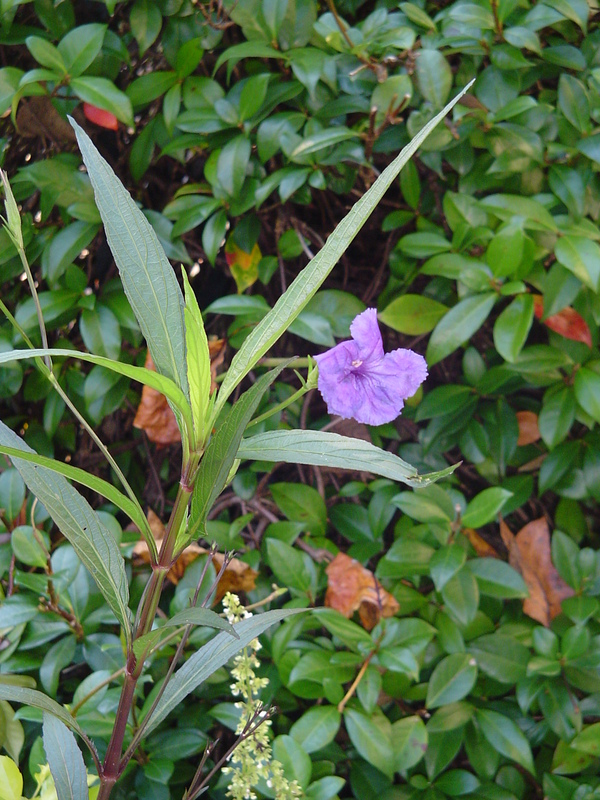 Mexican Petunia, a tender perennial, has taken root in a pot where it might make it through a Virginia winter. Dill and African Blue Basil are still in bloom. The Basil has grown huge this year. This in between time is awash in color as flowers, berries, leaves, stems, air and sun vie with each other for the brightest most sparkling hues. A day like today is a gift, a golden moment out of the ever changing year. Knowing that the first frost can come any night, maybe even tonight, we wander the garden with appreciation; enjoying the gorgeous afternoon. 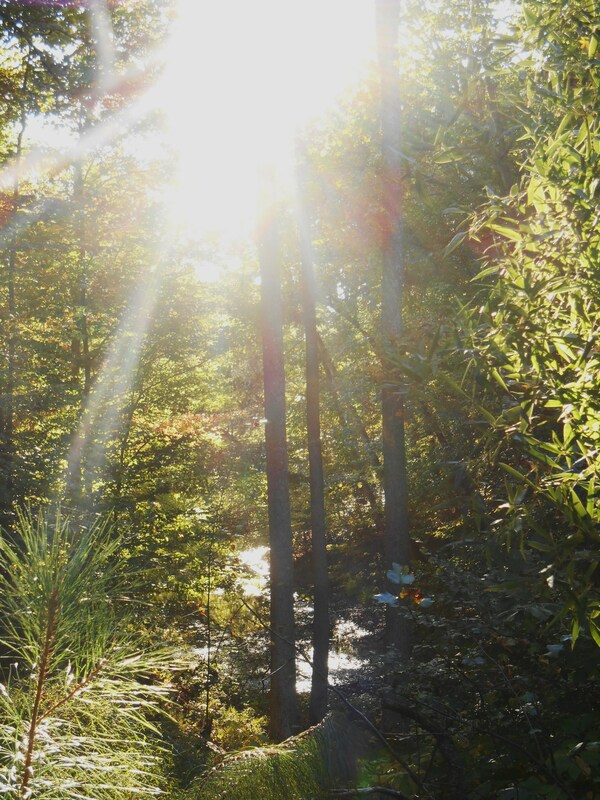 We’ve learned that autumn in Virginia mixes all of the seasons together in an unpredictable jumble. We’ve had 80 degree days in December, October snow, tropical storms at Halloween, and “endless summer” days after frosty breath mornings. To see all of the buds and flowers in the garden today, you might think it May. 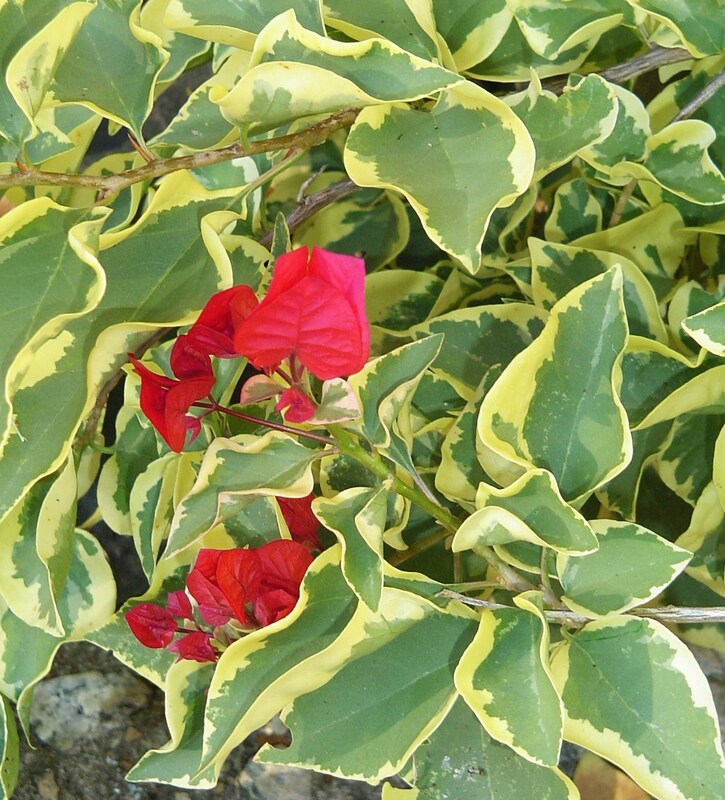 The Bougainvillea has only been blooming a few weeks. I hope it can stay outside a few weeks longer in a sheltered spot. But, it’s late October. And I’m still procrastinating. There are Caladium tubers to dig, but I hate to disturb them. 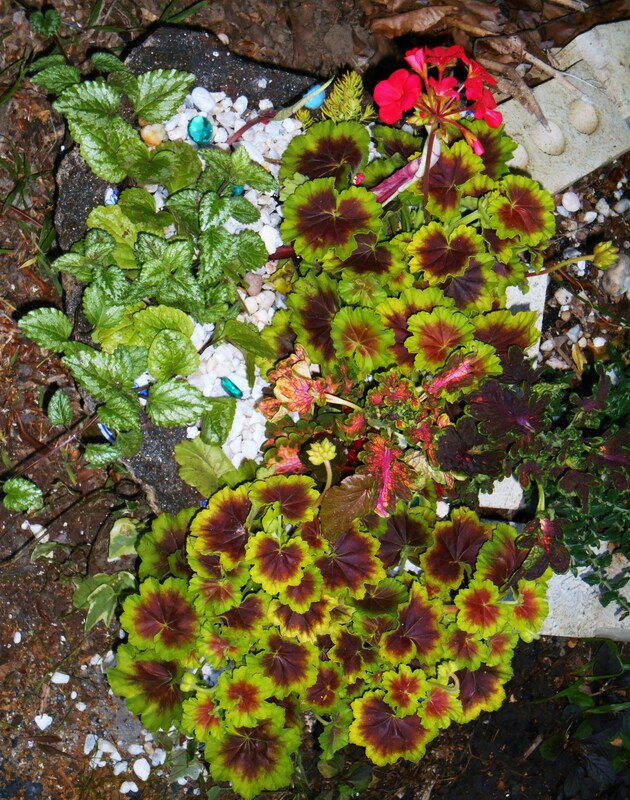 Rex Begonias to pot and move indoors, and Coleus to dig out and replace with Violas. And it may turn warm again next week. I’ll save those chores for another, gorgeous afternoon. 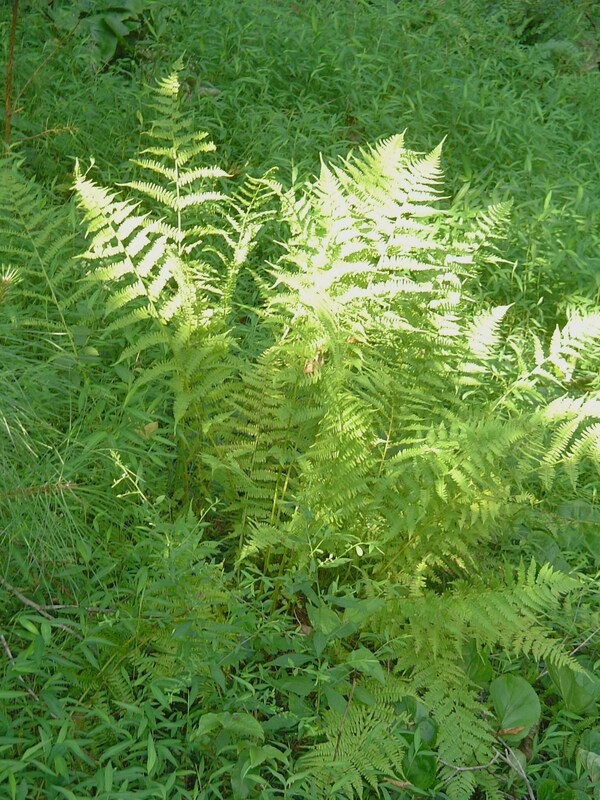 This Lady Fern has grown on the bank for years, never bothered by the deer. 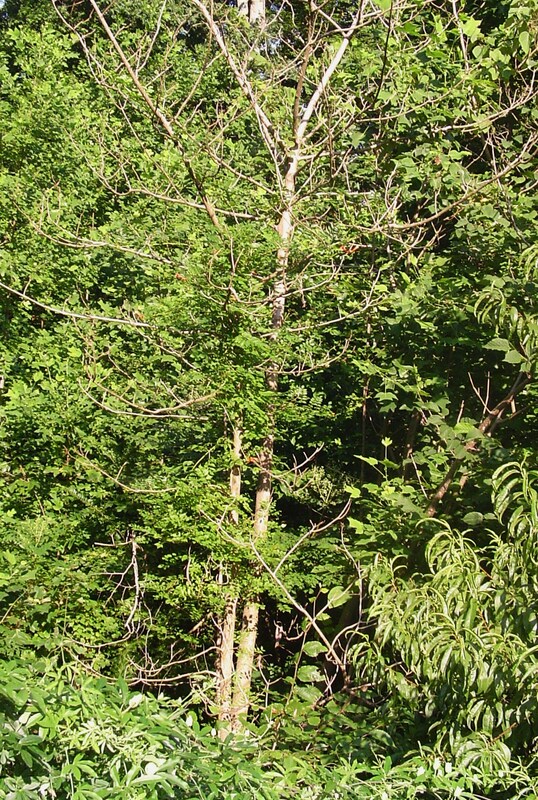 It is deciduous, but returns each spring larger than the year before. 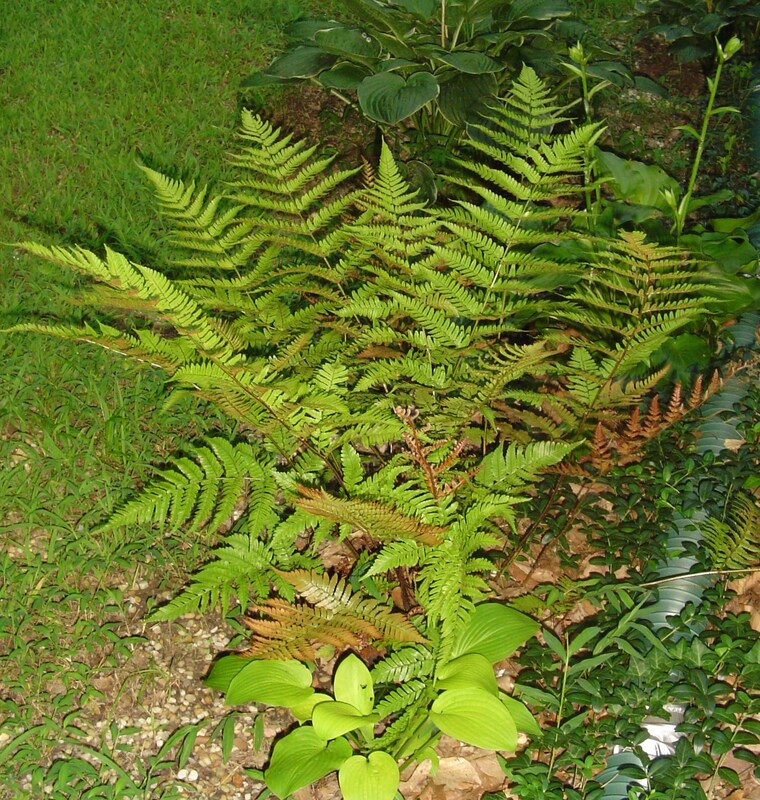 The plants in the following list are mostly ignored by our herd of deer. 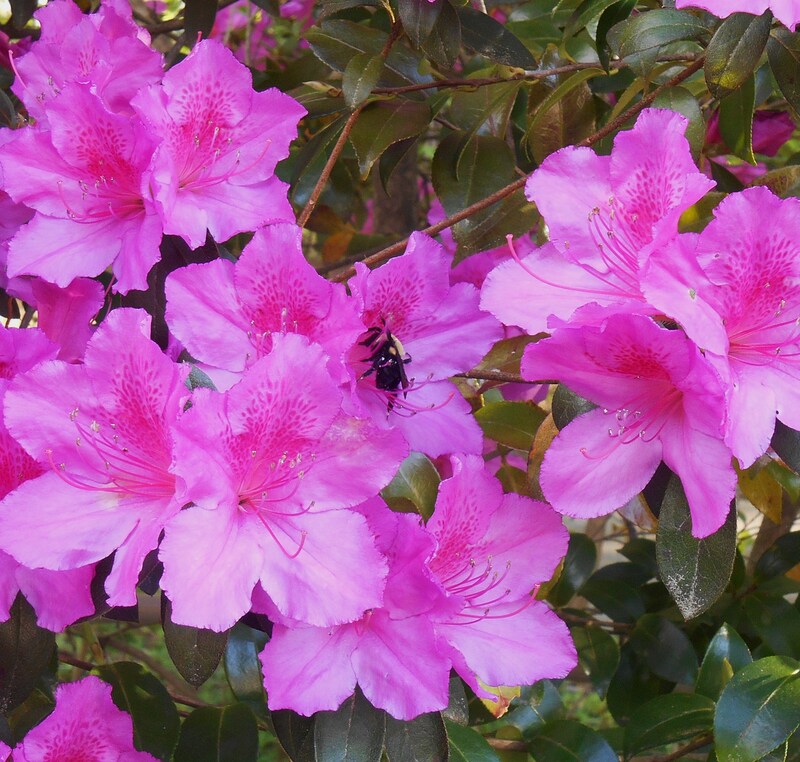 They are well suited to our Williamsburg, Virginia Zone 7B climate and our soil. Some gardening friends and I have been compiling this list over the last few years. We have observed that plants which grow extremely well in some of our gardens, such as Camellias and Hydrangea macrophylla, also called mophead Hydrangea; get eaten in others. Our mature Camellia shrubs are left alone, but I’ve had tremendous damage done to some, but not all, newly planted Camellias. Even newly planted oakleaf Hydrangeas have been stripped of their leaves during the last few weeks. In fact, newly planted trees and shrubs are the most vulnerable because they are rich in the nitrogen based fertilizers growers lavish on them. They taste salty and delicious to deer, like salted French fries for us. 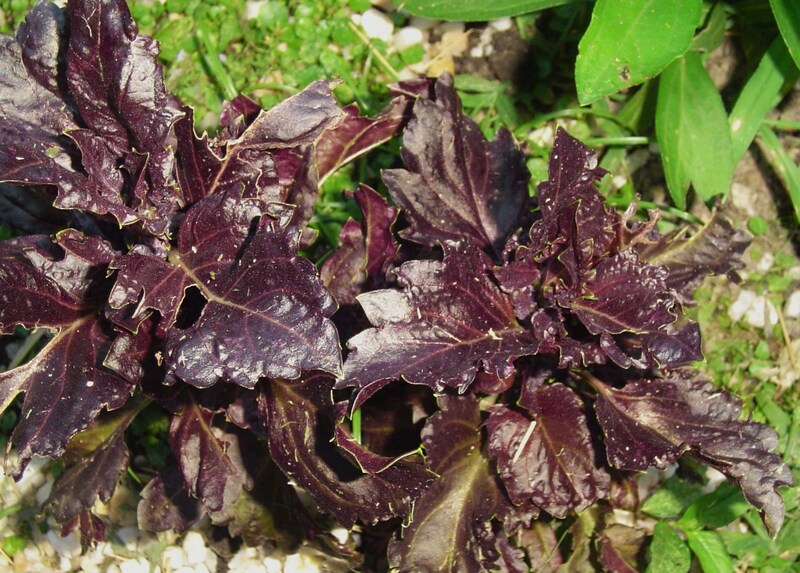 Plants which have been in the garden a while tend to have less nitrogen in their leaves and so aren’t as tasty. When considering how much extra fertilizer to spread around your shrubs and trees, if any, this is an important consideration. Growing your garden on the lean side might offer additional protection from grazing. 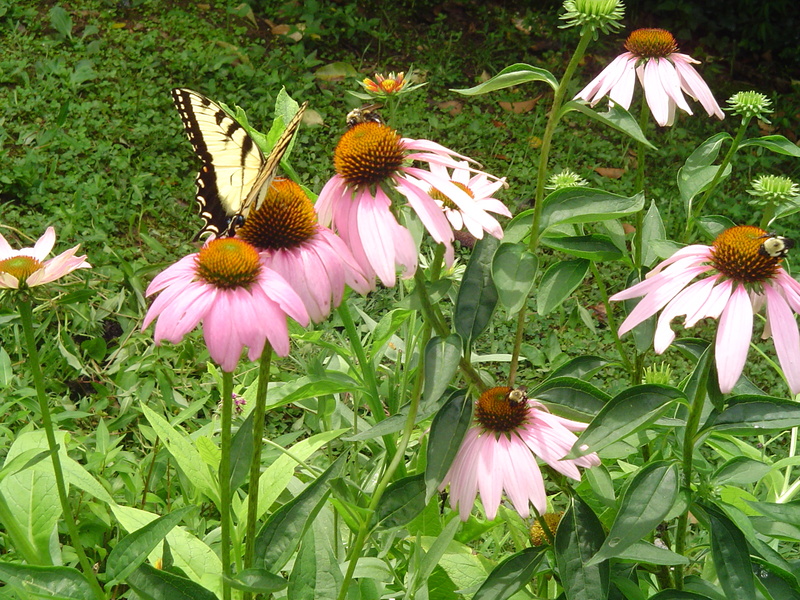 Echinacea, or Purple Coneflower, is a favorite of nectar loving insects. 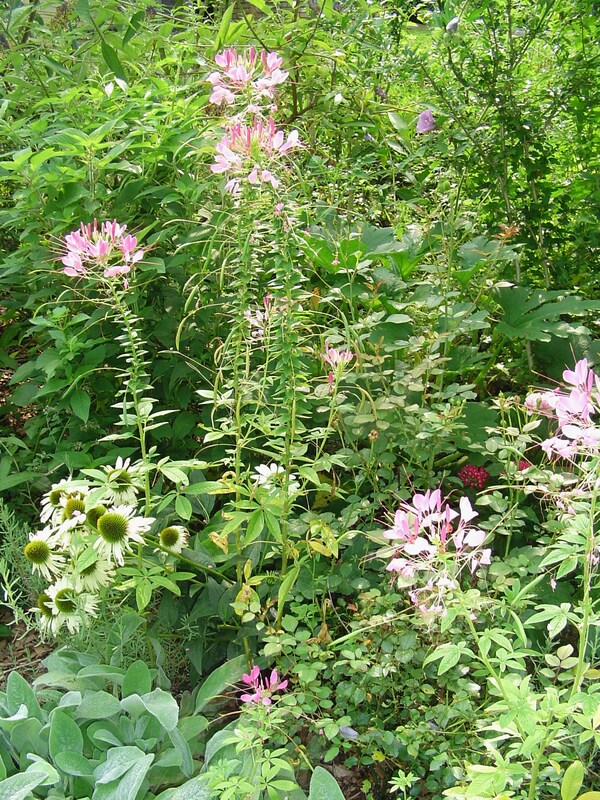 A perennial, it is rarely touched by deer and grows more vigorous each year. 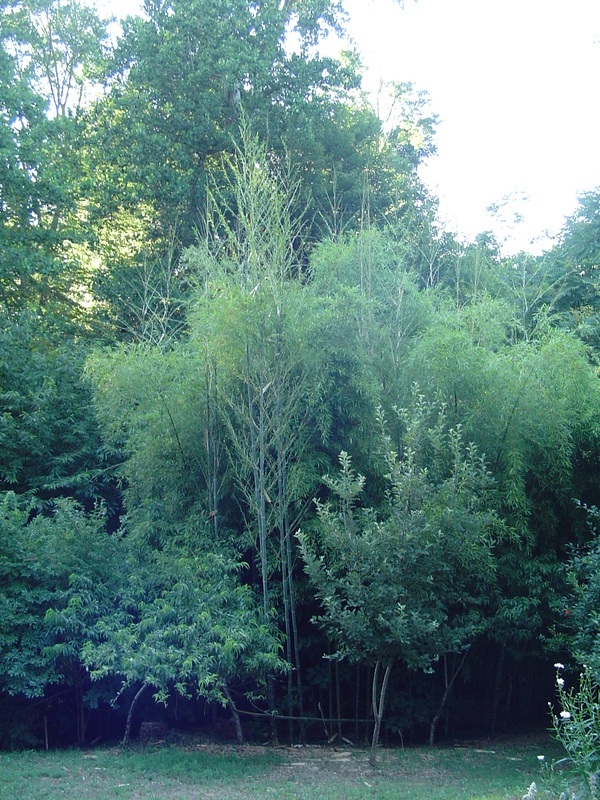 Bamboo provides cover for nesting birds, shelter from the weather, and a steady supply of insects to eat. Deer never touch it. 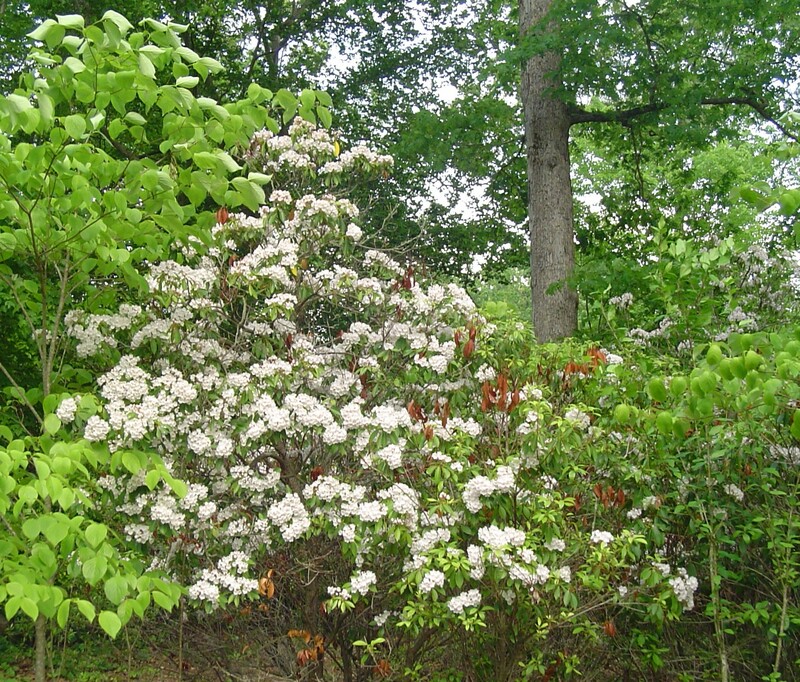 Mountain Laurel blooms in early May in our neighborhood. “Josee” re-blooming Lilac, in its second flush of bloom in late June, is appreciated by all the nectar lovers in the garden. 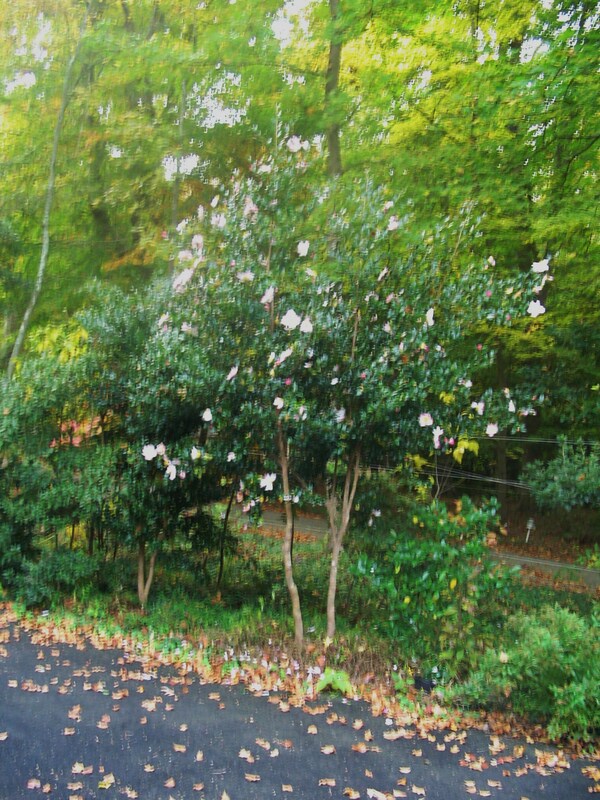 Fall blooming Camellia extends the months of bloom well into early winter. Deer don’t graze established shrubs. 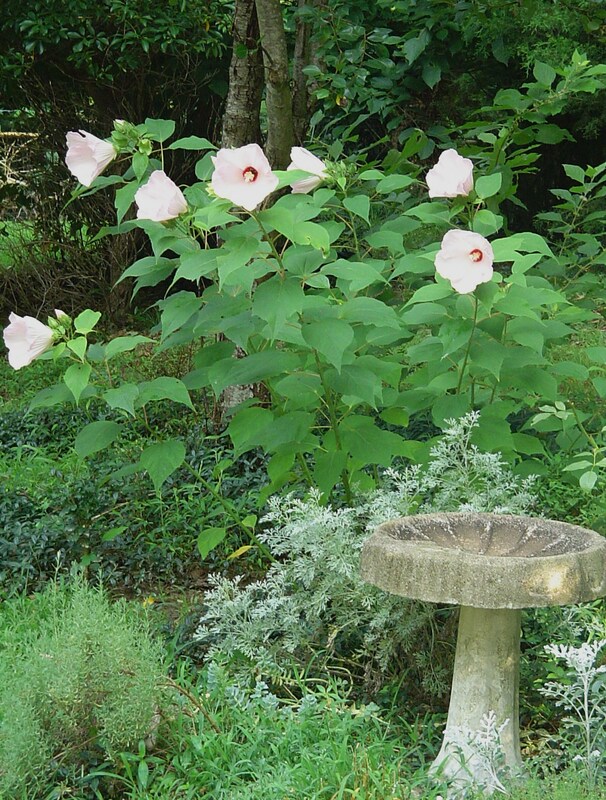 Rose Mallow, Lavender, Artemesia and Dusty Miller hold no attraction for hungry deer. Autumn Brilliance fern produces coppery colored new leaves throughout the season. Here, trying to protect a little Hosta. 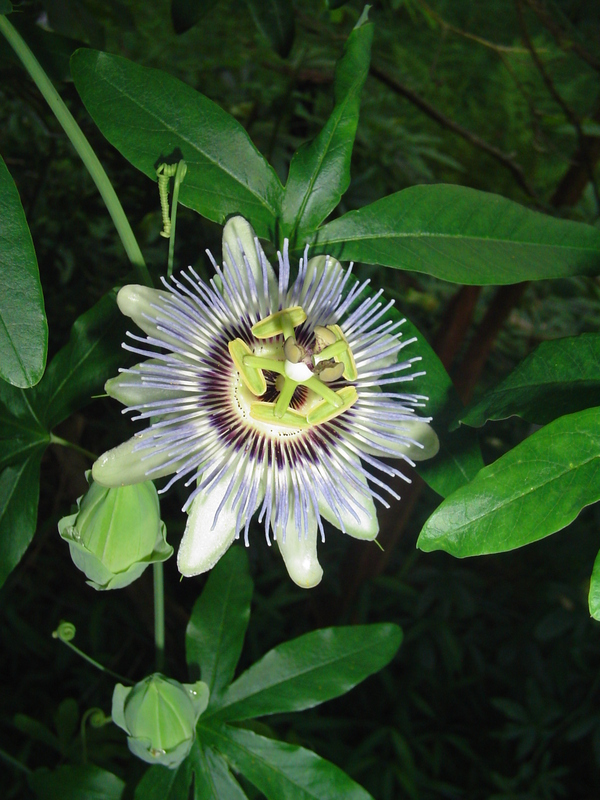 The Passionflower vine can grow up to 50′ a year and produces edible fruit. Grown throughout warm climates, this perennial vine is beautiful and productive. Re-blooming Irises will bloom again in late summer, and then continue throwing out blooms through December. They need to grow in an area of full sun to continue blooming. 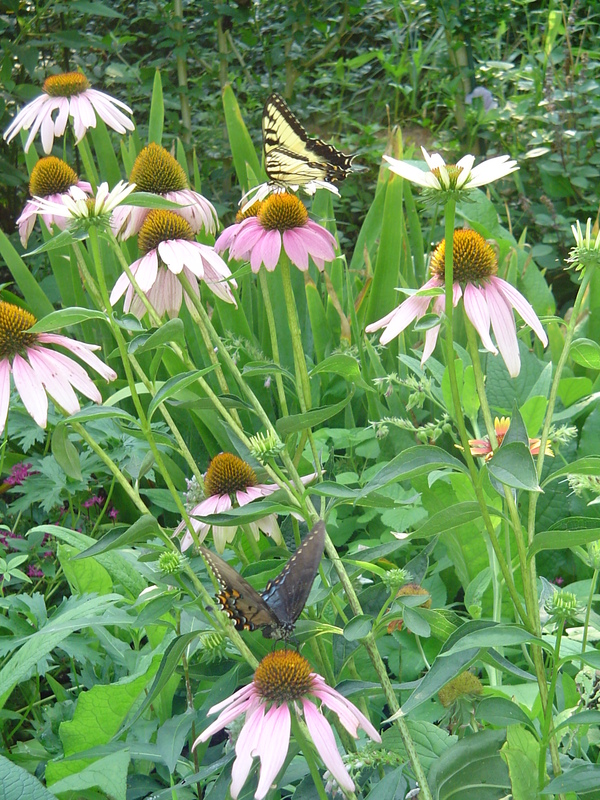 Butterflies enjoy Echinacea growing here with Gaillardia, Comfrey, Pentas, and other herbs. 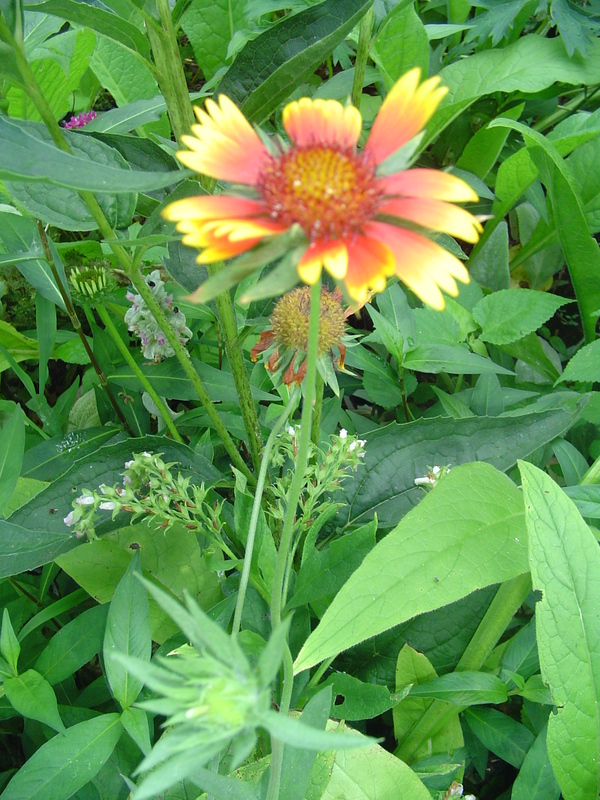 Gaillardia, gift from a friend’s garden, growing here with Comfrey. Purple Ruffles Basil is one of he most beautiful. 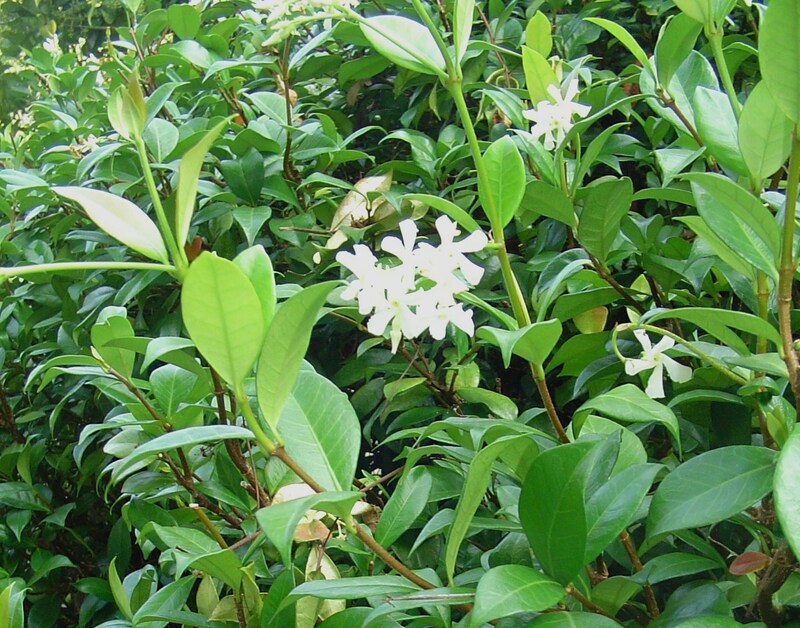 Star Jasmine, also known as Confederate Jasmine, is evergreen, fragrant, and a magnet for butterflies. Very hardy, it grows enthusiastically. 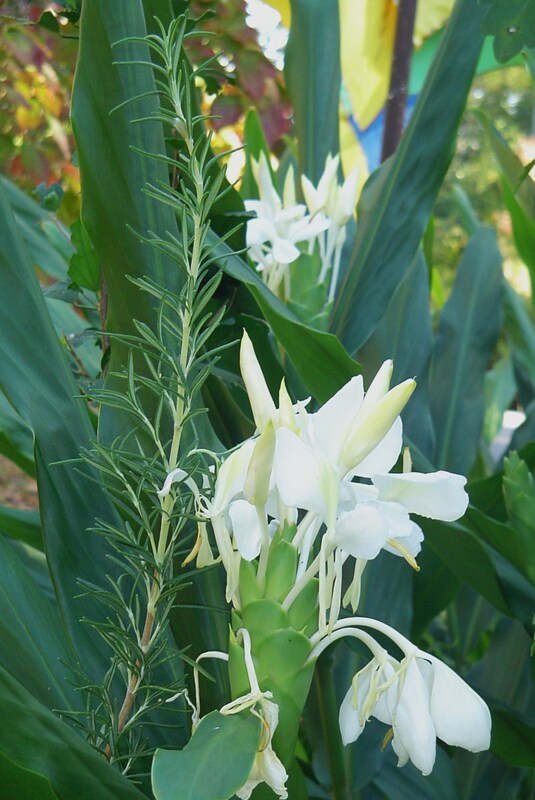 Yucca filamentosa in bloom in partial shade. 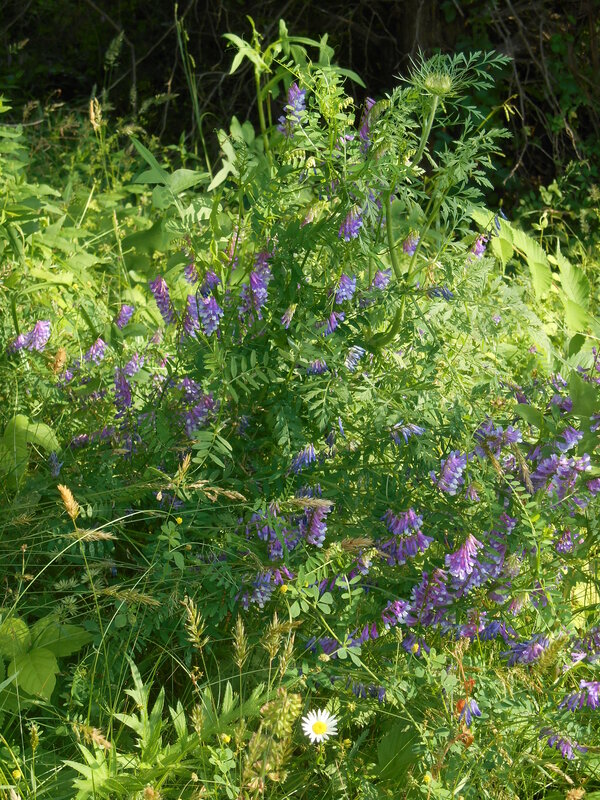 Purple Heart, Sage, and purple Pentas are safe from deer grazing. 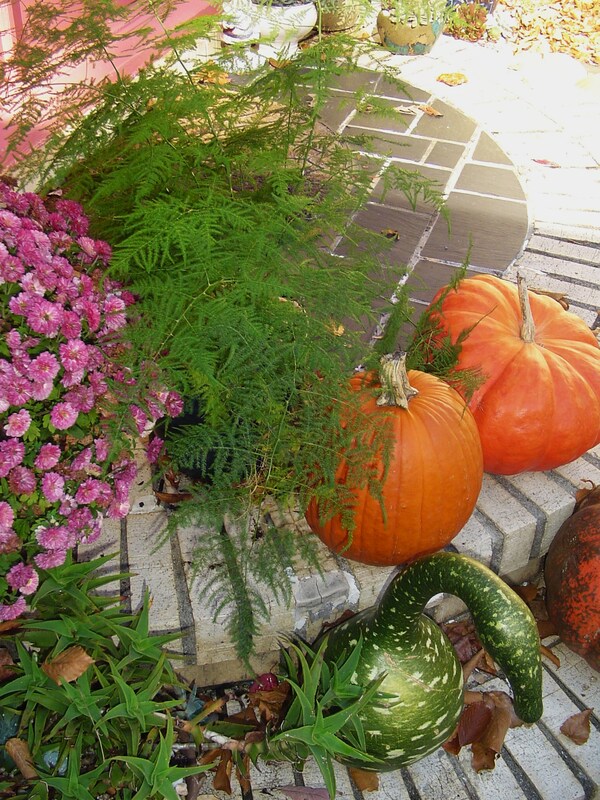 Azaleas, Hostas, daylilies, lilies, roses, impatiens, some Sedums, Tomatoes, squashes, sweet potato vines, cucumbers, beans, and mophead Hydrangeas. All photos by Woodland Gnome. 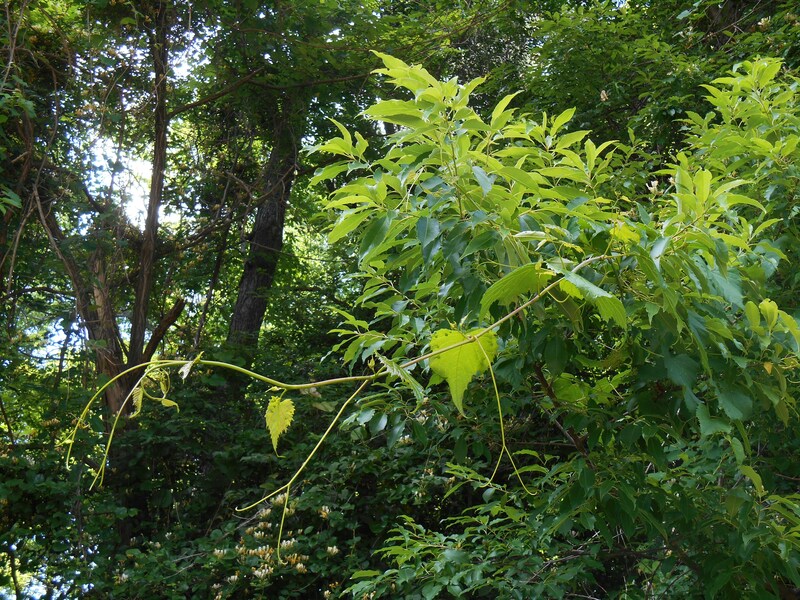 Virginia Creeper is growing up this dead Black Locust tree, delighting all hummingbirds and butterflies in the garden with its huge orange blossoms.